What has to be the largest Mexican flag in all of Mexico waves over Dolores Hidalgo. It’s visible from the mountain road long before the city appears, and it’s a beacon which flies there for good reason. 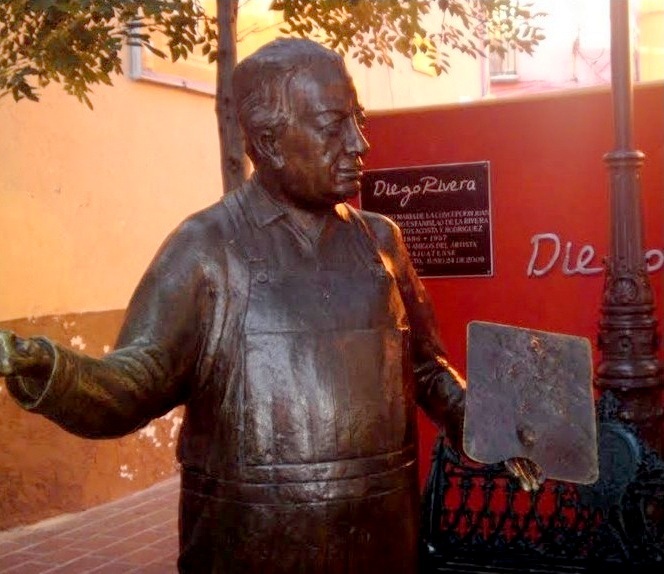 The town – to which the name of Mexican patriot Father Miguel Hidalgo is now affixed – is where Hidalgo uttered the Grito – his famous cry for Mexican independence – on September 16, 1810. 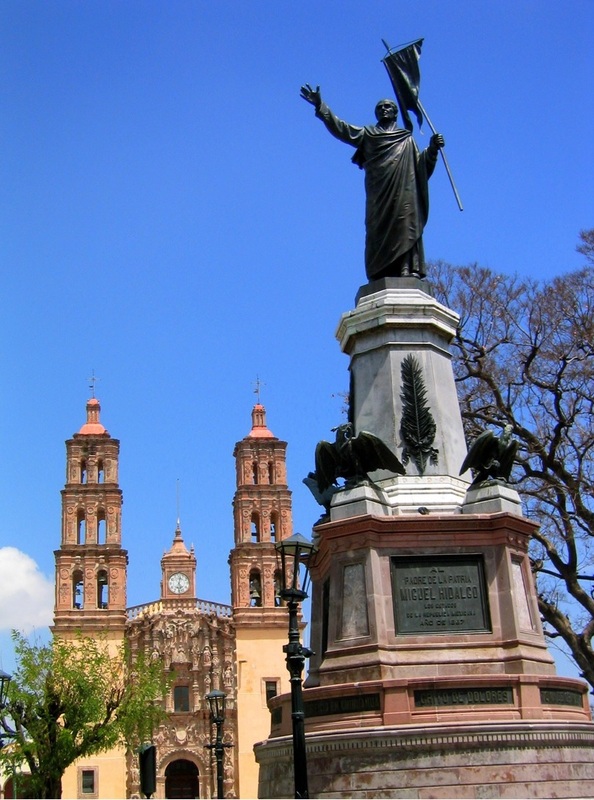 Within a year, his rebellion’s early successes were reversed and his head was impaled on a spike upon the ramparts of the Alhondigas in Guanajuato, where his army achieved its first major victory. It would take ten more years for Mexico to free itself from the Spanish crown, but every year on September 16, the Grito is re-enacted in the city’s historic central plaza – the zócalo – as in thousands of cities across Mexico. 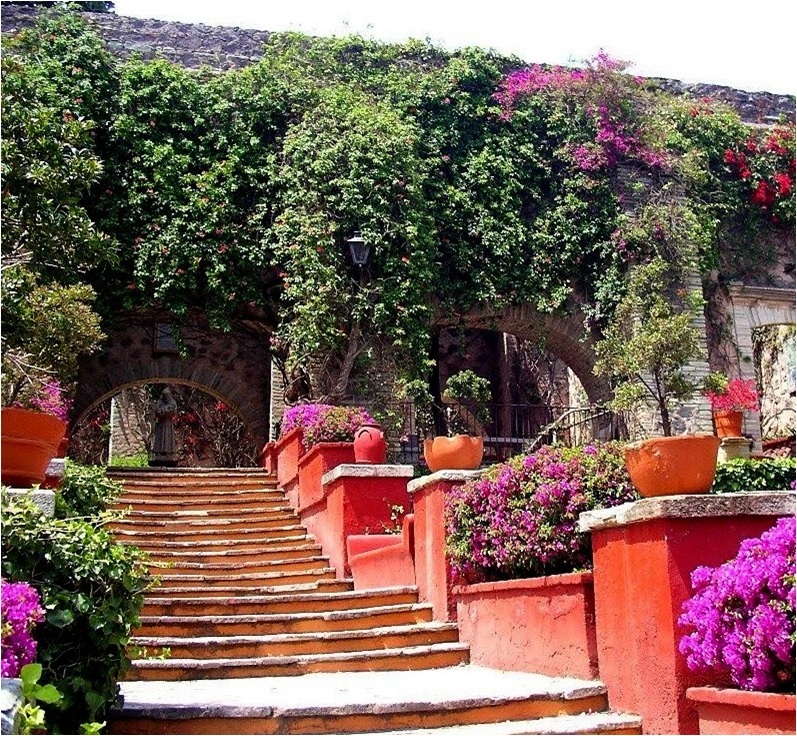 But Dolores Hidalgo’s role in the Mexico’s War of Independence is only one of the good reasons that the city has been named one of Mexico’s “Pueblos Mágicos” – Magical Towns. 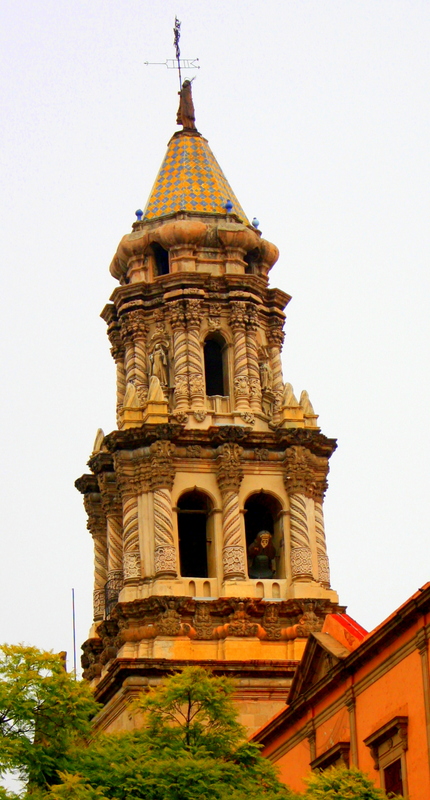 The center of Dolores Hidalgo is the zócalo, and it’s dominated by a statue of Father Hidalgo and by his historic church, the Parroquia de Nuestra Señora de los Dolores. 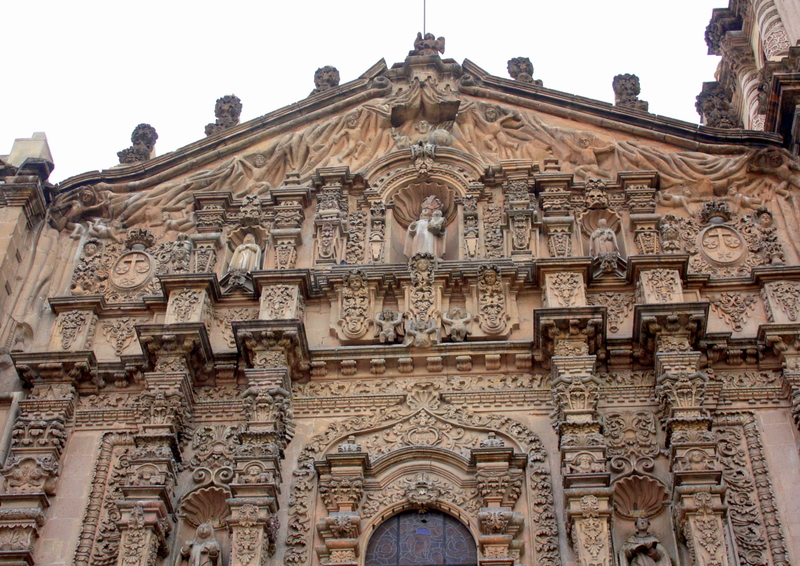 As I walk the plaza, I check out a church facade done in the ornate Spanish Baroque “Churrigueresque” style and bearing intricately carved figures. 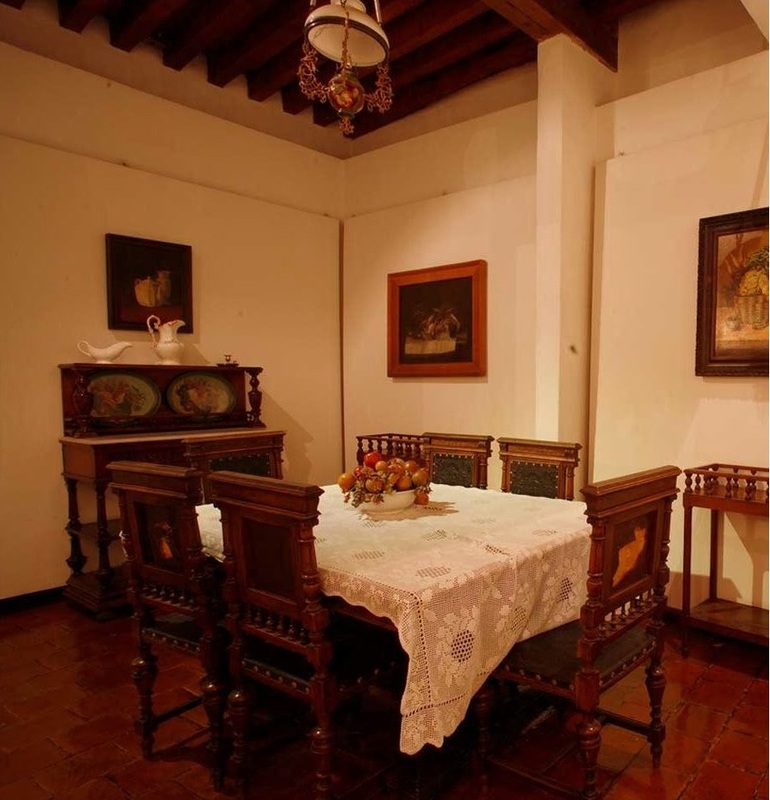 History buffs will enjoy the nearby Museo de la Independencia, in which are displayed artifacts of the war of independence. 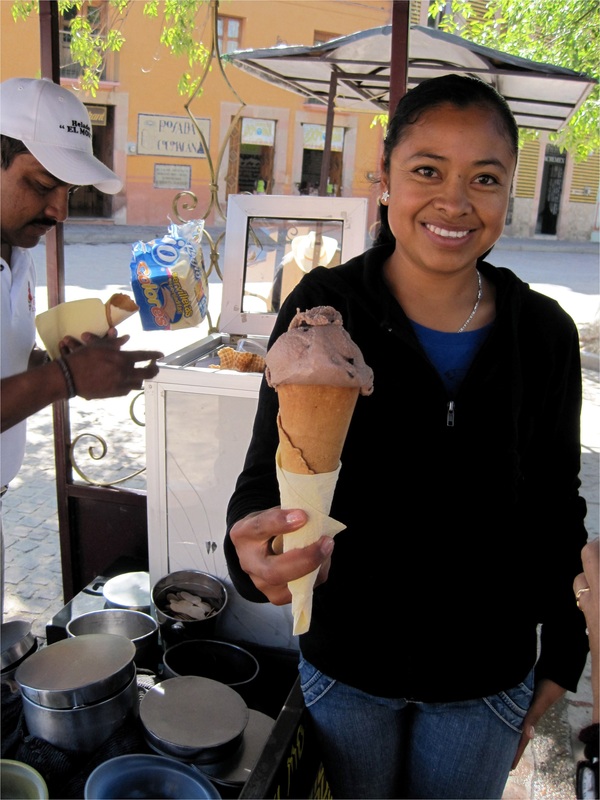 Until I visited Dolores Hidalgo, I thought that Michoacán was the epicenter of Mexican ice cream, but a walk around the zócalo – where homemade ice cream is sold daily from the many push carts – quickly convinced me otherwise. Nowhere but the at the State Fair of Texas annual Fried Food Contest – known for its improbable ingredients – have I tasted so many quirky (yet all very tasty) flavors. On my visit, featured flavors ranged from the traditional fruits and nuts and chocolate to the truly exotic and even bizarre. But who wants vanilla, chocolate or strawberry when you can have mango or papaya? Perhaps avocado or corn? Fried pork skins, chile, or mole? Shrimp or octopus? Or maybe cerveza, tequila, or pulque? 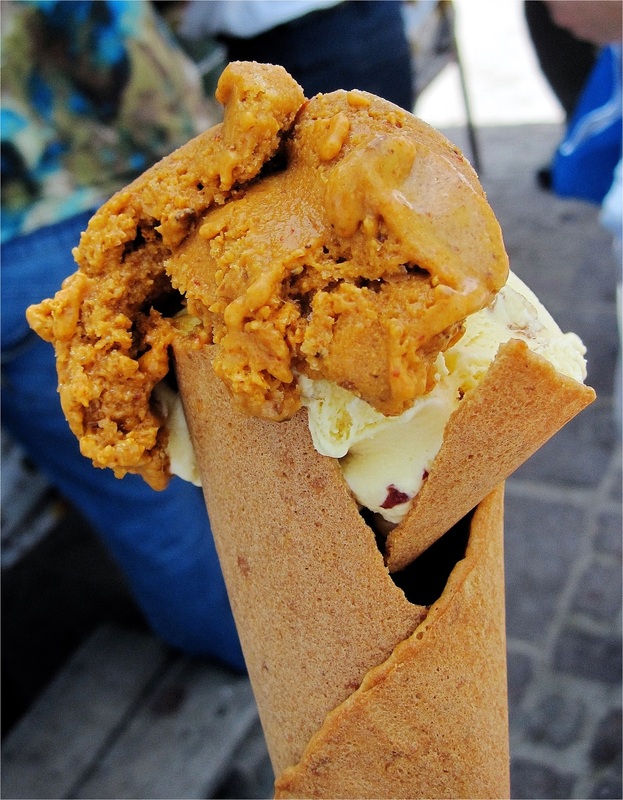 Vendors are constantly competing to come up with the next new flavor, so it’s an experience constantly re-invented. 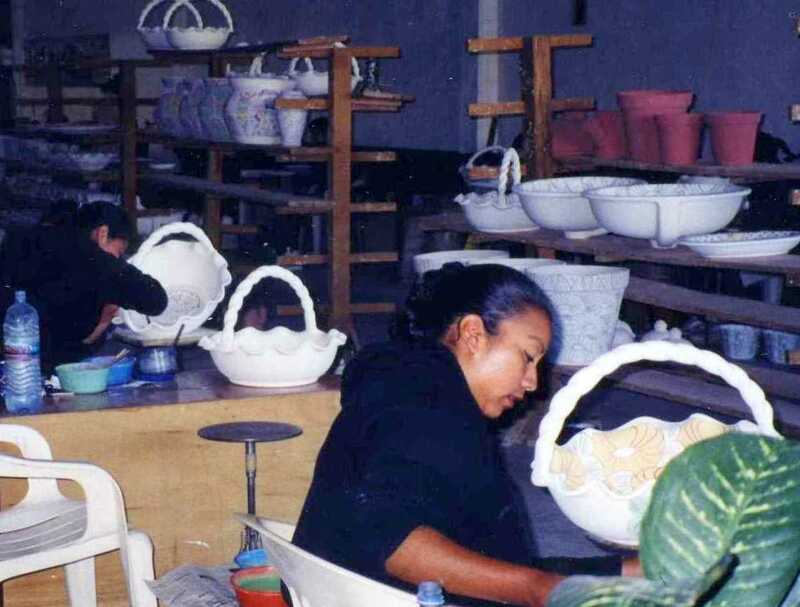 Today, Dolores Hidalgo it is widely renowned for its ceramics, the production of which directly or indirectly employs more than half of the city’s workers. 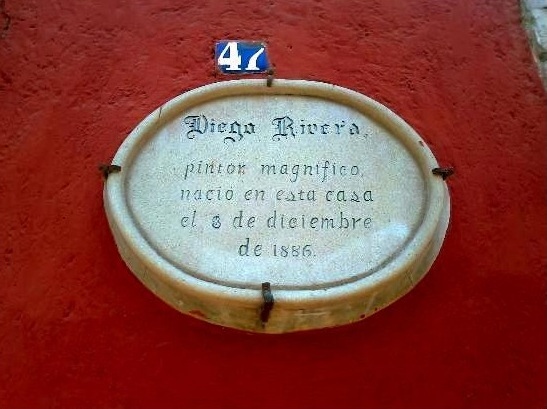 It was Father Hidalgo who introduced Talavera pottery techniques from Puebla to the people of Dolores Hidalgo. 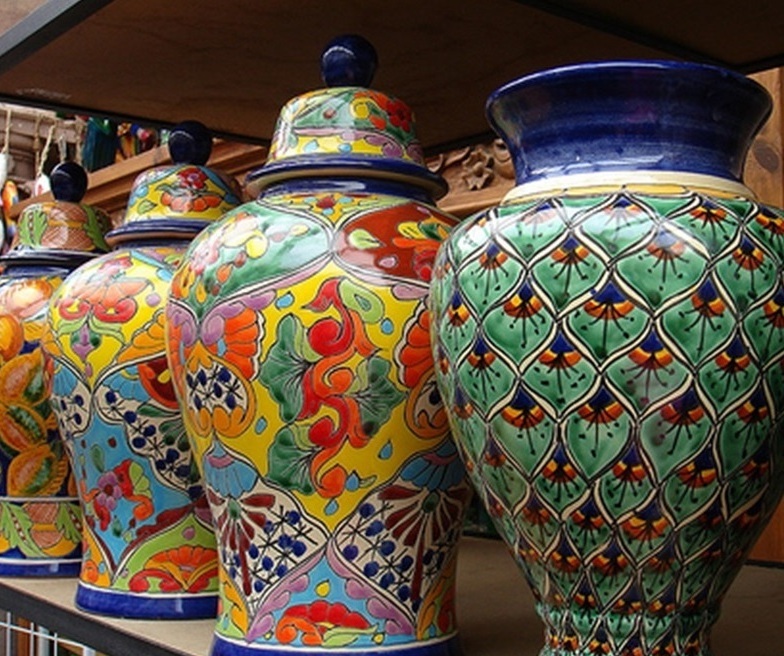 Since 1997, only ceramics from Puebla can be designated as “talavera,” but the Puebla techniques are still practiced here, as they have been for three centuries. 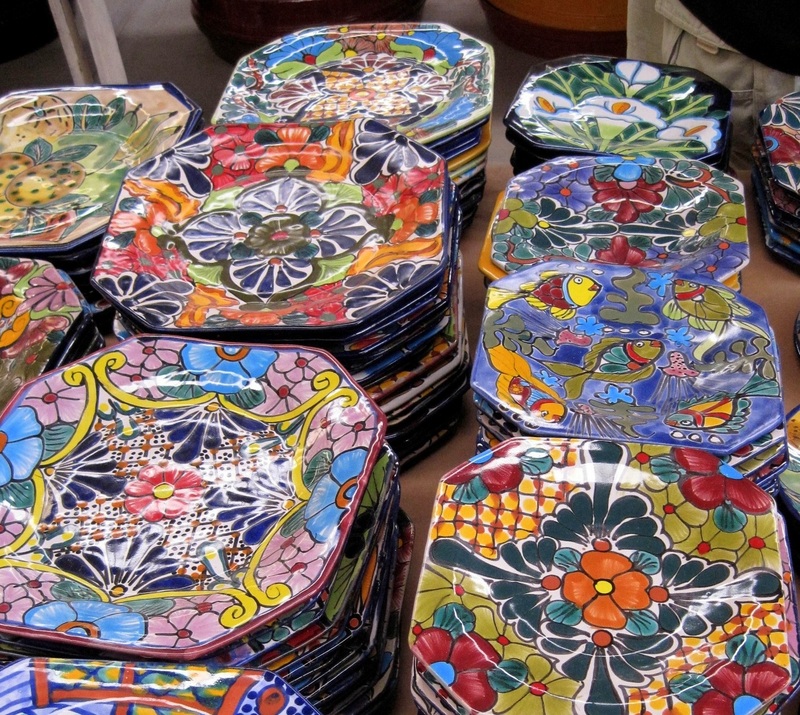 While Dolores Hidalgo is one of the main producers of majolica glazed tiles, its workshops produce a staggering array of ceramics including dinnerware, vases, pots and jars, mosaics, bathtubs, bathroom sinks, and soap dishes, and even light switch covers and bird baths. There are plenty of shops selling ceramics on the side streets just off the zócalo, but it’s far more interesting to visit one of the workshops that line the approach to town. There visitors can walk among the artisans as they work, which is a real treat, since everything is made and decorated by hand. 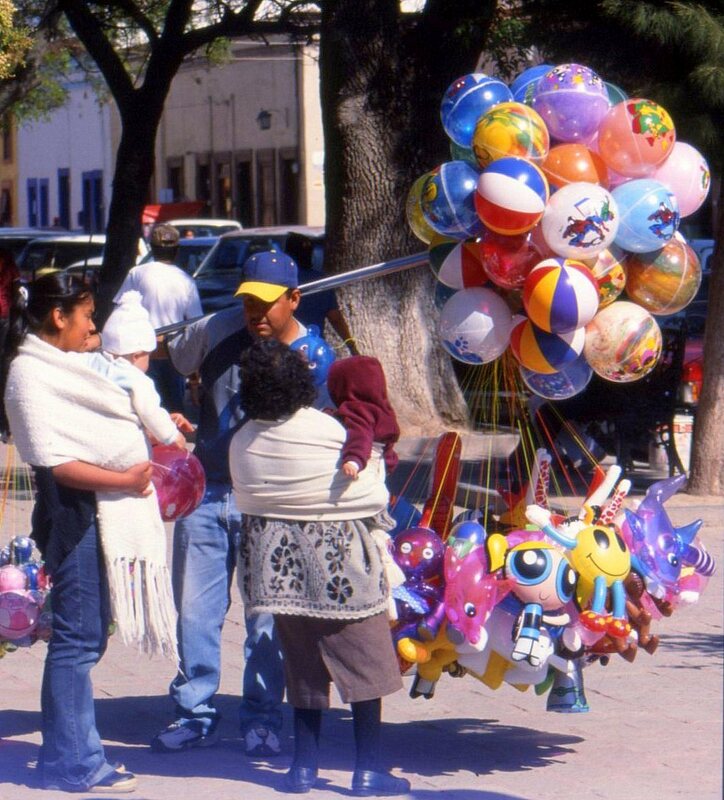 Because Dolores Hidalgo is not a major international tourist destination, it retains much of its colonial charm and all of its Mexican authenticity. 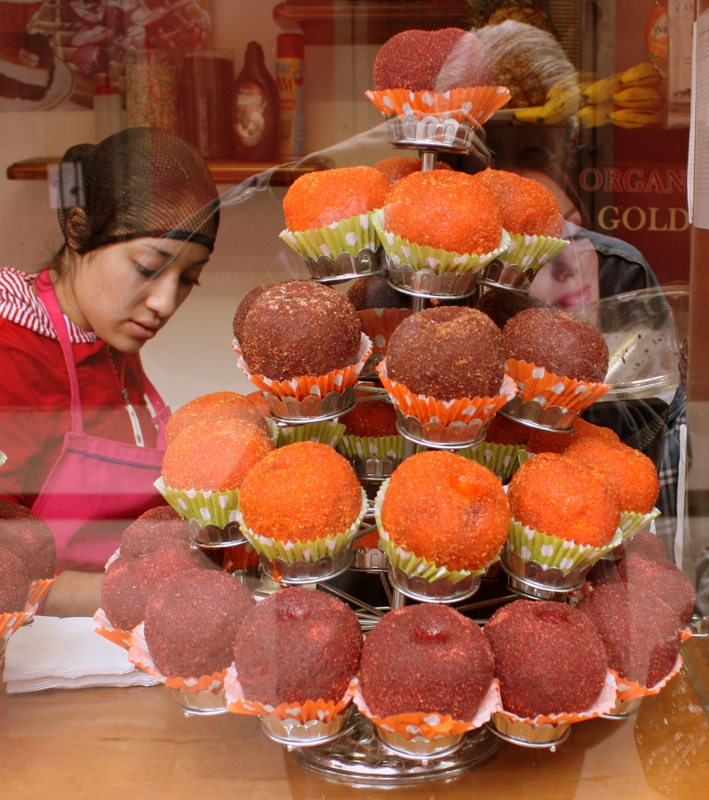 No visit to Guanajuato, San Miguel de Allende, or Queretaro is complete without including this side trip. 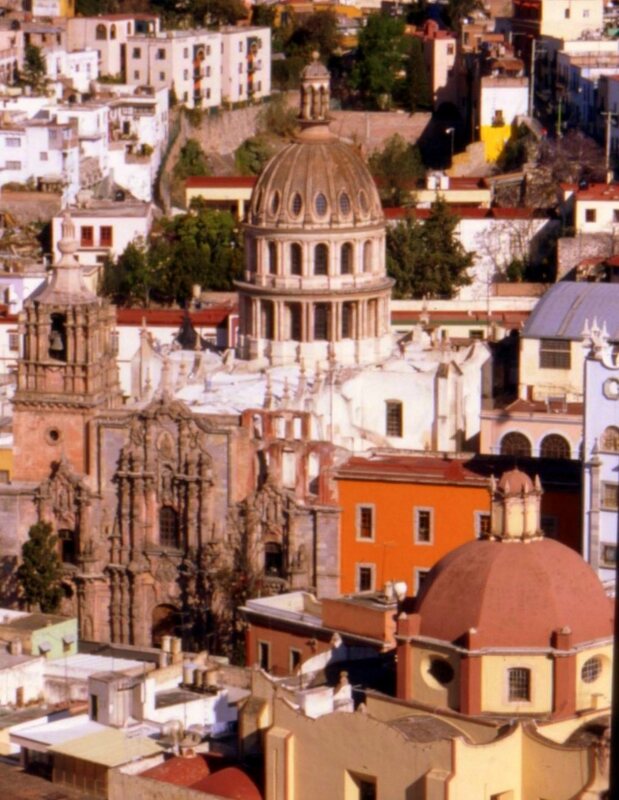 Also in the state of Guanajuato and just down the road from Dolores Hidalgo is a mystical world heritage site that’s the subject of my next post. Diego Rivera was a prominent Mexican painter whose large scale wall frescos dealt mostly with social and political themes arising from Mexico’s 1910 revolution. He painted in Mexico City and in the U.S. between 1922 and 1953, and was instrumental in establishing the Mural Movement in Mexican art. 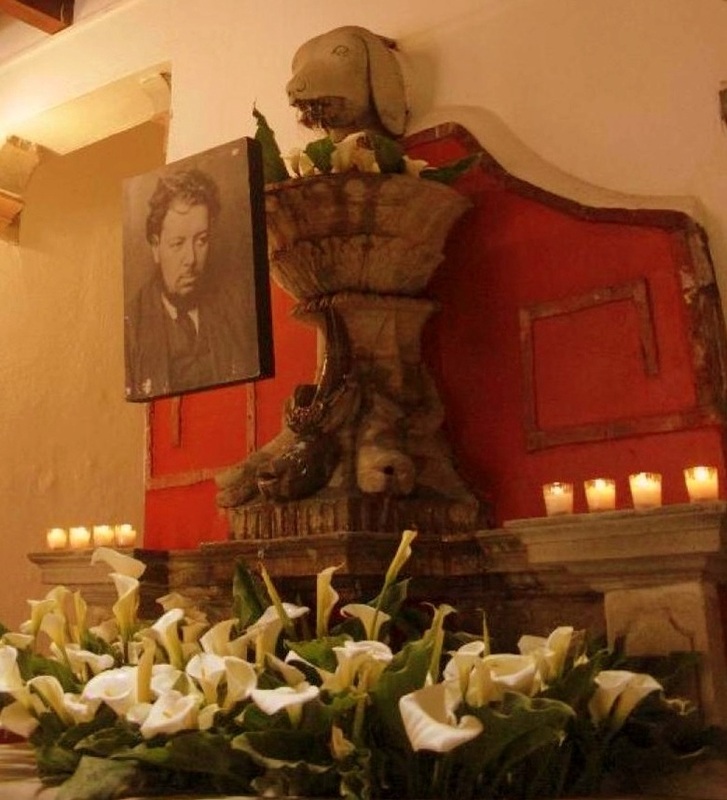 Guanajuato’s Museo Casa Diego Rivera is located in the house where the artist was born, and where he lived until the age of ten, when his family moved to Mexico City. 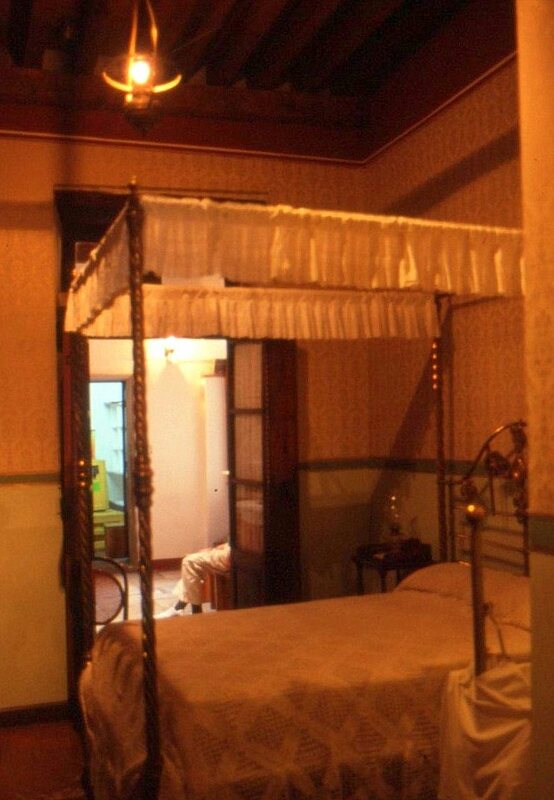 Living quarters on the ground floor are furnished in period antiques. The upper floors house a permanent collection of nearly one hundred original works and sketches that span more than forty years. Rivera was a man of contradictions. 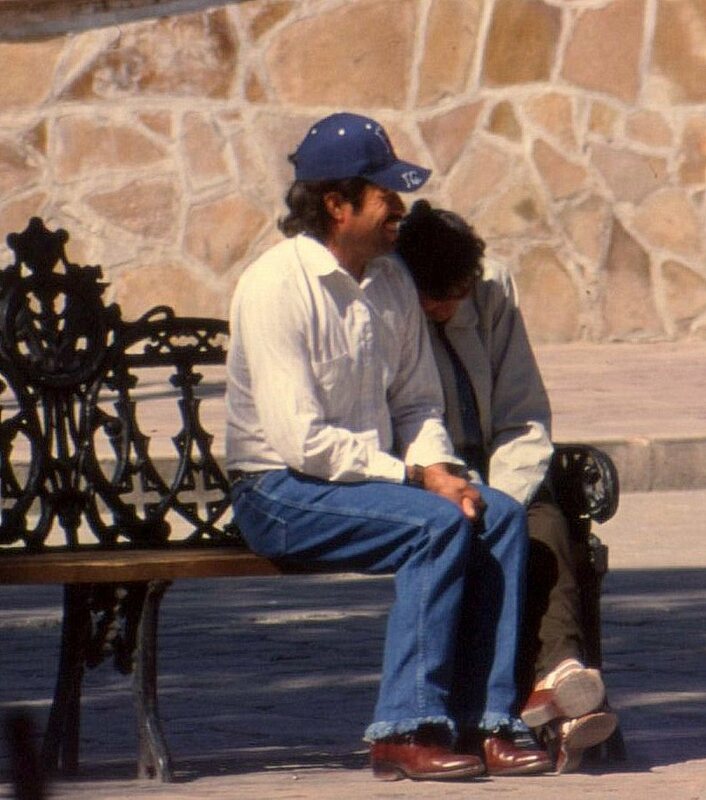 Born into a well-to-do family, he became an ardent Marxist and his politics made him a persona non grata in Guanajuato for much of his life. Born the son of a Catholic father and a Converso mother whose Jewish ancestors had been forced to convert to Catholicism, he was a lifelong atheist. A year after his twin brother died at the age of two, Rivera began drawing on the walls of the family house and his parents installed chalkboards and wall canvasses to encourage his talent. He was already studying art in Mexico City at the age of ten, and continued his studies in Madrid and then in Paris, where he lived and worked among the Montparnasse artists and where his friend Modigliani painted his portrait. Rivera also traveled extensively through Italy, studying Renaissance frescoes. His early work embraced the emerging school of Cubist art, but by 1917 he began to adopt a new style that emphasized simple forms and large patches of vivid colors with an Aztec influence. He painted his first significant mural, “Creation,” at the National Preparatory School in Mexico City in 1921. During the work he carried a pistol to protect himself from right-wing students. His murals at the Secretariat of Public Education in Mexico City were painted between 1922 and 1928, and soon afterward he produced works for Cuernavaca’s Cortés Palace. Rivera arrived in Moscow in 1927 to celebrate the 10th anniversary of the October Revolution. Also attending was Alfred Barr, later the founding director of New York’s Museum of Modern Art, where a retrospective exhibition of Rivera’s works was held in 1931. While in Russia, Rivera received a commission for a mural in Moscow’s Red Army Club, but was expelled from the country because of involvement in anti-Soviet politics, and the next year he was expelled from the Mexican Communist Party. 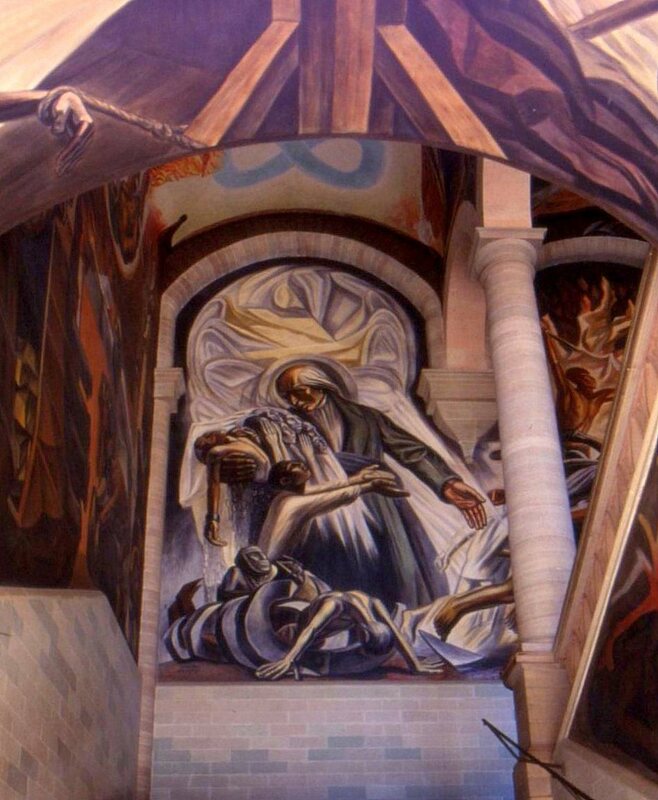 Following his return to Mexico City, he produced a series of murals in the National Palace. In 1929 he married his third wife, artist Frida Kahlo. He was 42 and she was 22, Their mutual infidelities and his violent temper would lead to their divorce in 1939 and remarriage in 1940. 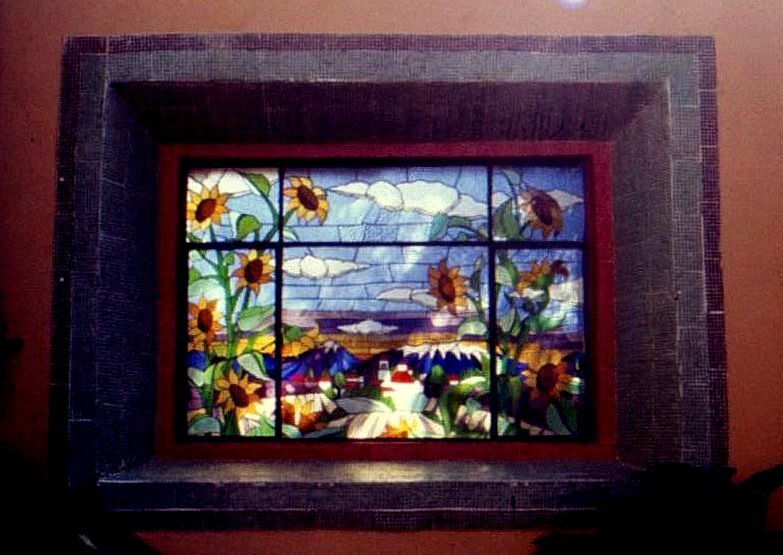 In 1930, after completing a commission for murals in the National School of Agriculture at Chapingo, and the Palace of Cortés in Cuernavaca, Rivera accepted commissions from the City Club of the San Francisco Stock Exchange and from the California School of Fine Art. The work he produced there is now on display in the Diego Rivera Gallery at the San Francisco Art Institute. Between 1932 and 1933, Rivera completed the twenty-seven panels of his work “Detroit Industry”, commissioned by Edsel Ford, on the walls of an inner court at the Detroit Institute of Arts. His 1933 mural “Man at the Crossroads”, commissioned by John D. Rockefeller, was removed from the Rockefeller Center following a furor over its inclusion of the image of Lenin. When Diego refused to remove it, Rockefeller ordered Rivera to leave and the mural destroyed. The censorship became a cause celebre among New York’s artistic community. While Rockefeller detested Rivera’s art for its politics, Edsel Ford saw the art separately from the politics, and was a staunch defender of the artist’s talent even during the McCarthy witch hunts of the 1950s. The negative publicity over the Rockefeller Center mural, though, lost Rivera a commission for the Chicago World’s Fair. In 1934, Rivera repainted the Rockefeller Center mural in Mexico city’s Palacio de Bellas Artes. He returned to the U.S. for the last time in 1940 to paint a ten-panel mural for the Golden Gate International Exposition in San Francisco titled “Pan American Unity”. 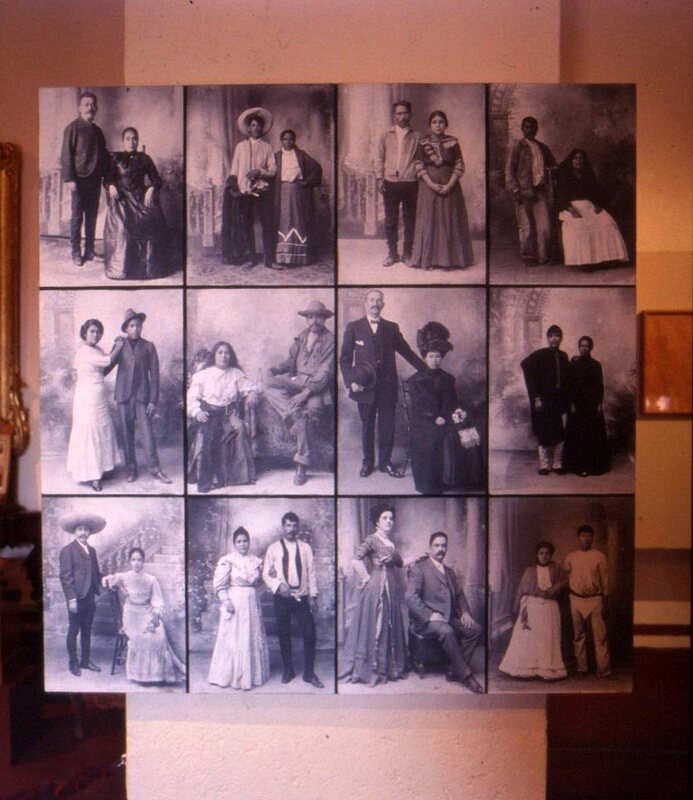 The mural and its archives now reside at City College of San Francisco. 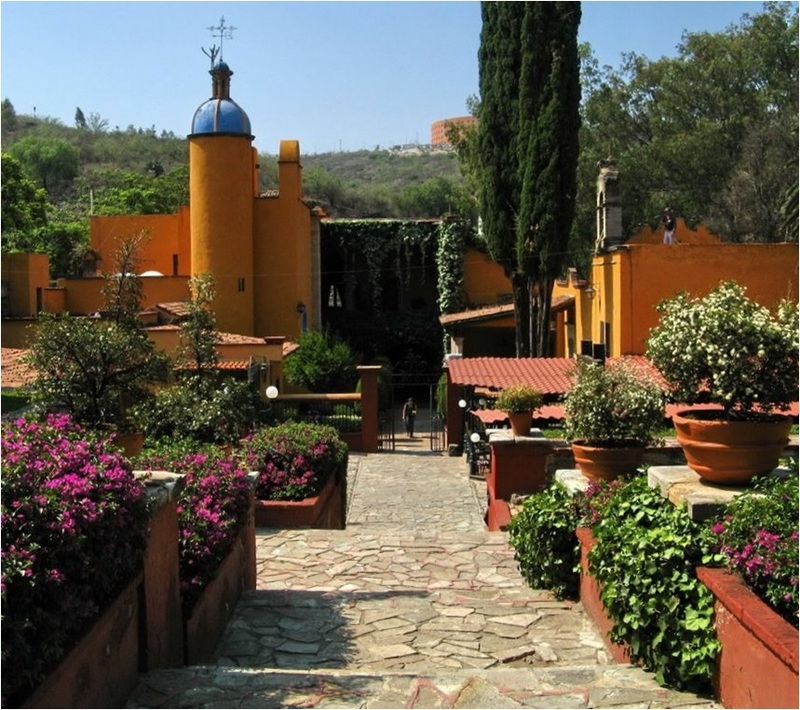 There’s plenty more to see on a future visit, but it’s still been a great day trip from San Miguel de Allende. A panel from Diego Rivera’s work “Detroit Industry” appears on the cover of my latest novel, Lifelines: An American Dream, available now on Amazon. 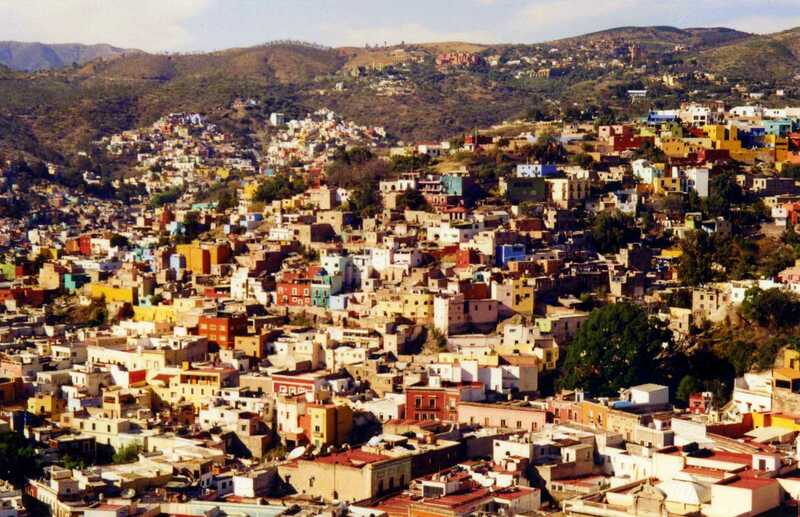 The first sight of Guanajuato is breathtakingly beautiful. Thousands of brightly colored buildings are draped across the hills like a mosaic carpet, and the colors are warm in the morning sunlight. It’s picture postcard perfect. 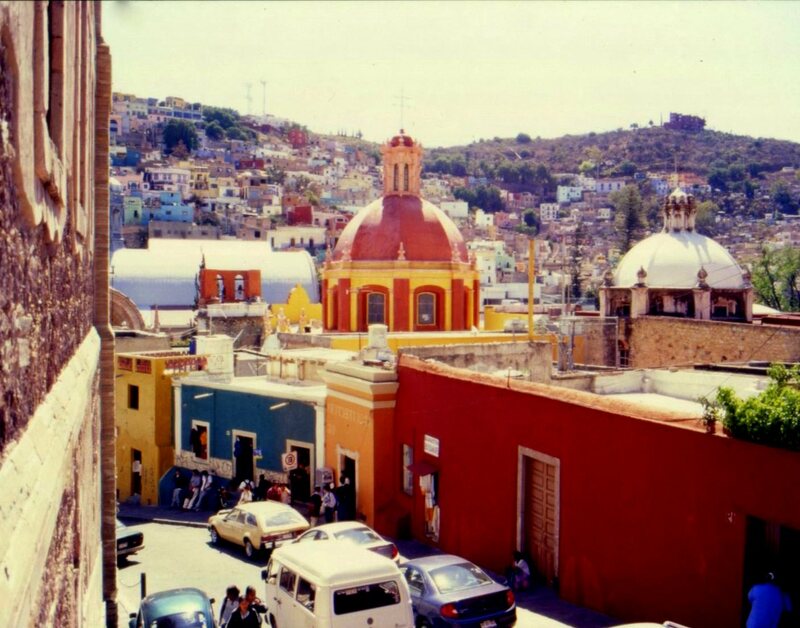 Guanajuato has played an important role throughout much of Mexico’s history, including its service as one of Mexico’s provisional capitals up until its capture during the French intervention in 1863 . 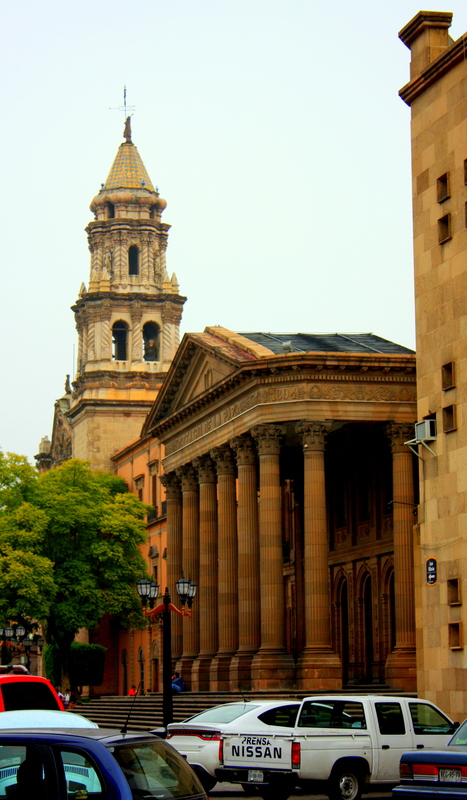 This city’s spirit is well summed up by its Plaza de la Paz – the Peace Plaza. This is where the wealthiest of colonial families built their homes. 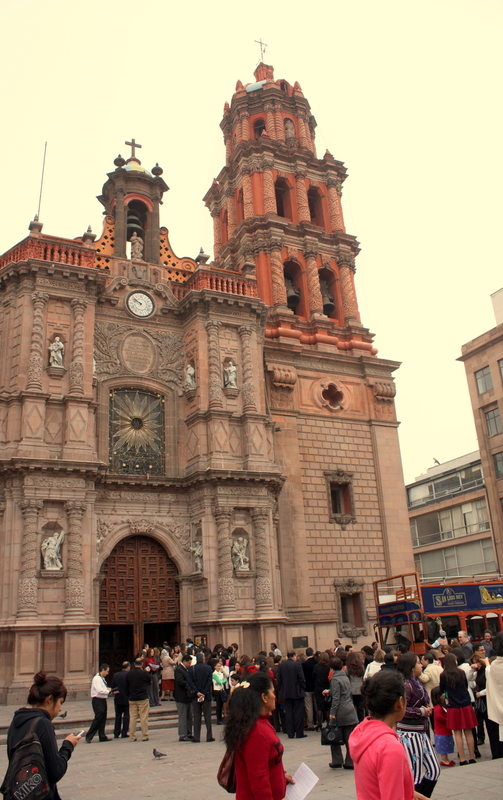 It is also the site of the Basílica de Nuestra Señora de Guanajuato – the Basilica of Our Lady of Guanajuato. One of the plaza’s most distinctive feature is an allegorical sculpture of the woman “Peace”. 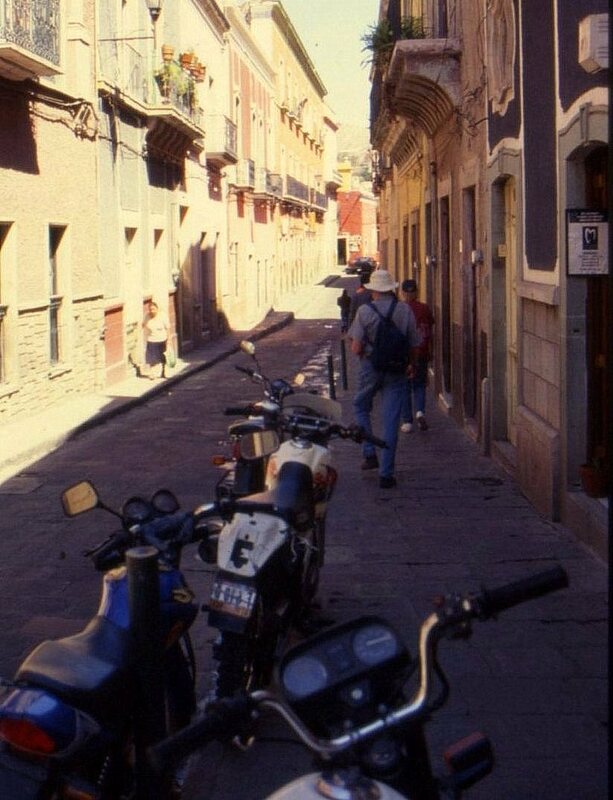 Since much of Guanajuato’s through traffic has been routed through the tunnels of abandoned silver mines which run below it, the narrow streets of the Centro Historico are very pedestrian-friendly, and beg to be walked. 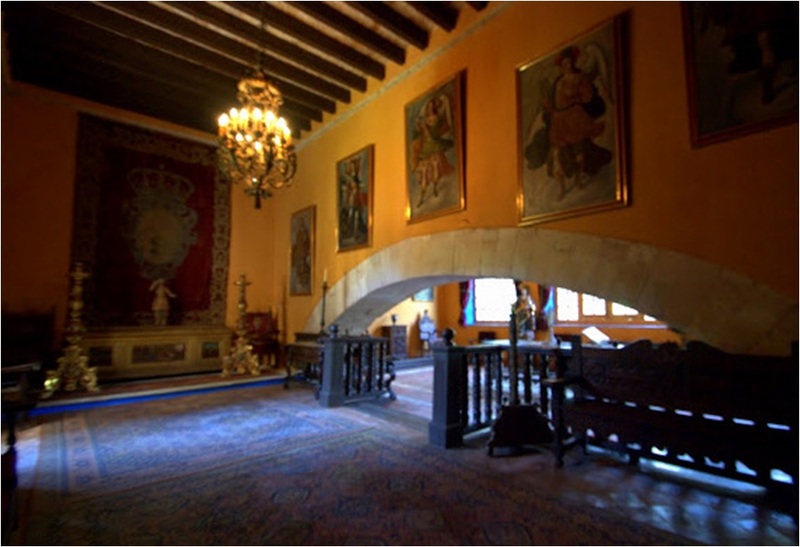 The Alhondigas de Granaditas – The Granary – dominates the old city, and has played a central role in its history for more than two hundred years. 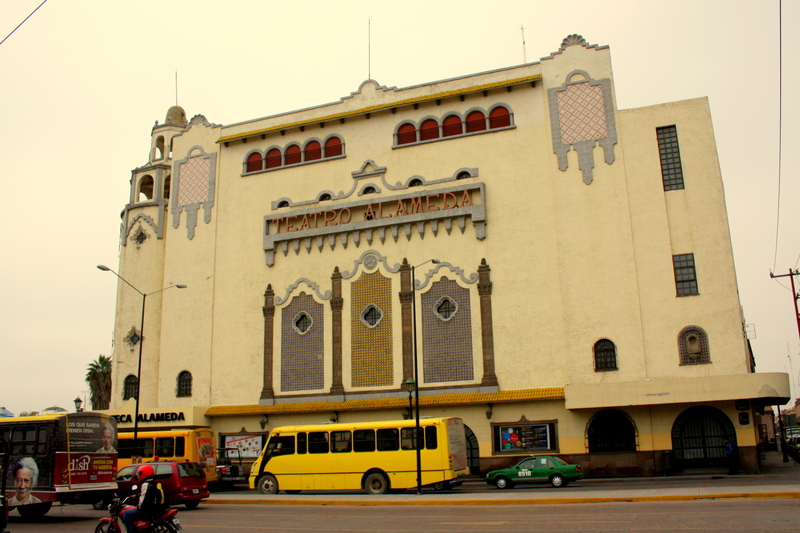 Today it is one of the venues for the Festival Internacional Cervantino, held here every fall since 1972. The festival celebrates the life and work of Miguel Cervantes, who is considered by Spanish-speakers to be as significant an influence on their literature as Shakespeare is to English literature. 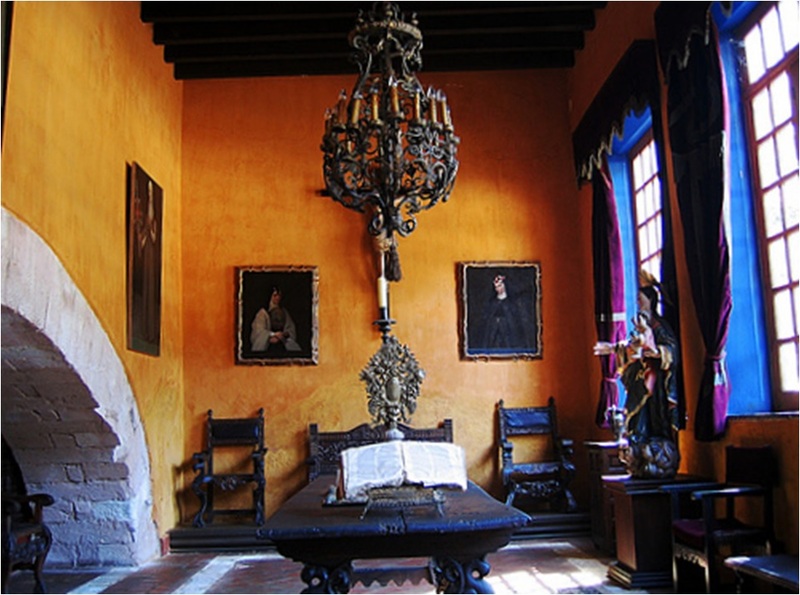 The Alhondigas is best known, though, as the site of the first battle in Mexico’s War of Independence. 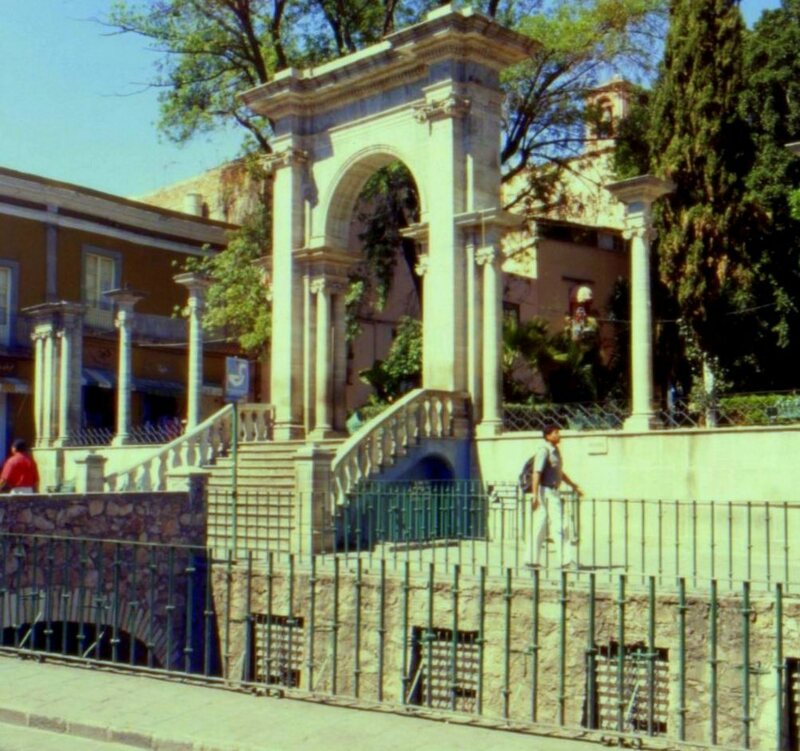 In 1810, insurgents led by patriot Miguel Hidalgo entered the city to find that Royalist troops and sympathizers had barricaded themselves – and millions of pesos of silver – in the Alhondigas. The Royalists were counting upon the granary’s thick and windowless walls and single gated entrance to resist a siege, and they were able to fight the rebels to a stalemate. 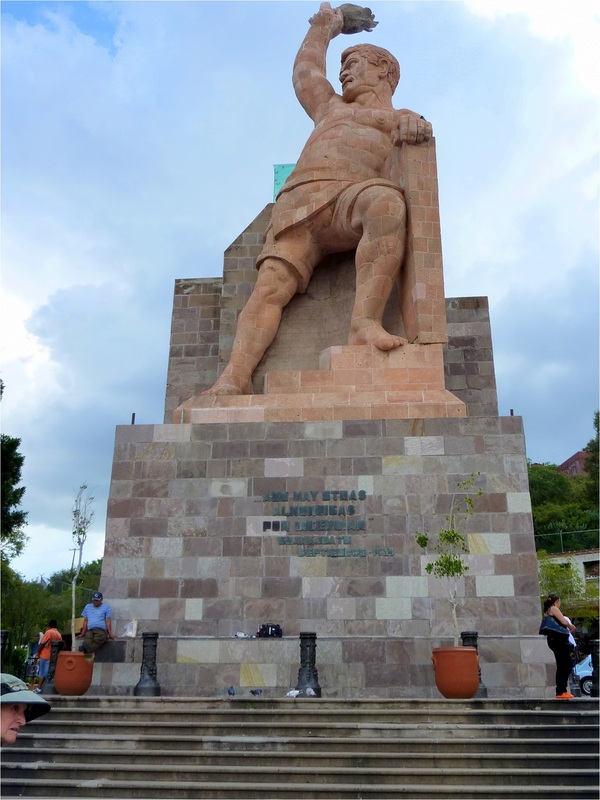 The impasse was broken when miner Juan José de los Reyes Martínez, better known to history by his nickname of El Pípila, armored himself with a large flat stone strapped to his back and crawled to the wooden gate with a flask of tar and a torch. Martínez’s courageous act enabled the patriots to take the building, and his heroism is commemorated by a colossal statue of him that now overlooks the city. 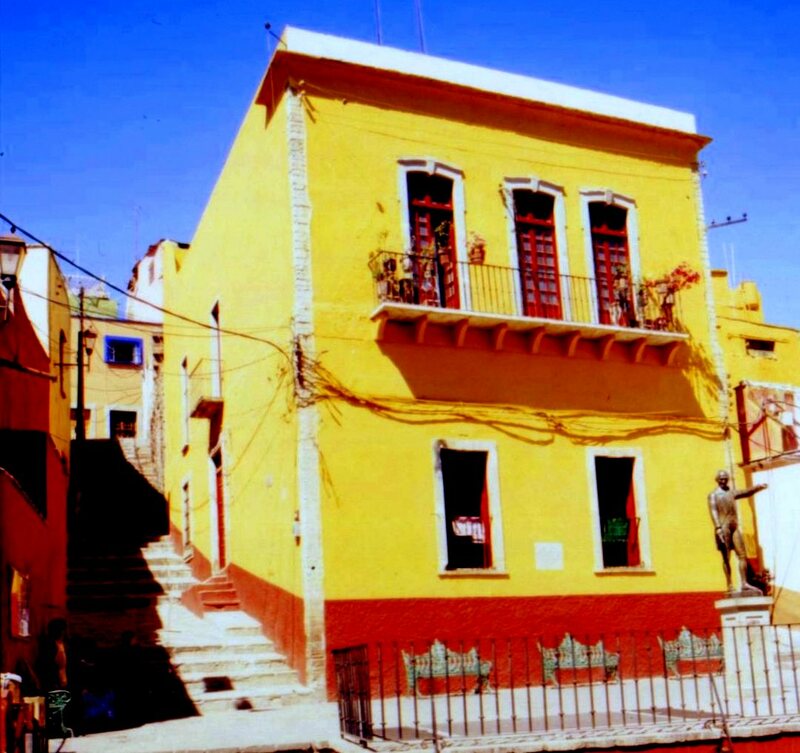 The building now serves as the Museo Regional de Guanajuato, documenting the city’s history from before the Spanish Conquest. Its architecture honors heroes of the Mexican Revolution with mascarons, gargoyle-like sculptures that incorporate their faces. 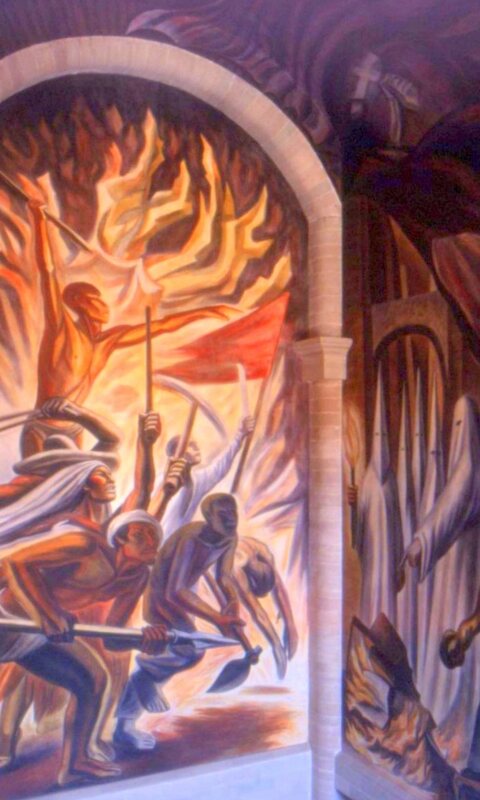 The walls of the main stairwell contain murals by José Chávez Morado that allude to Independence, along with paintings and photographs. It is a long-standing tradition to celebrate Mexico’s Independence Day with a reenactment of Miguel Hidalgo’s “El Grito de Dolores” – the call to arms – in the Alhondiga’s large courtyard. An eternal flame is re-lit here each year on the anniversary of the battle. 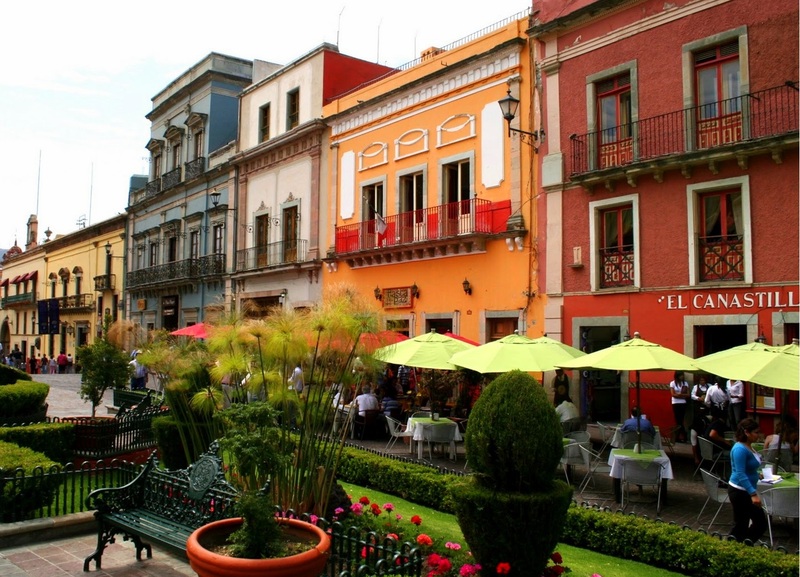 It ‘s no surprise that this charming and historic city is one of Mexico’s thirty-two World Heritage Sites. 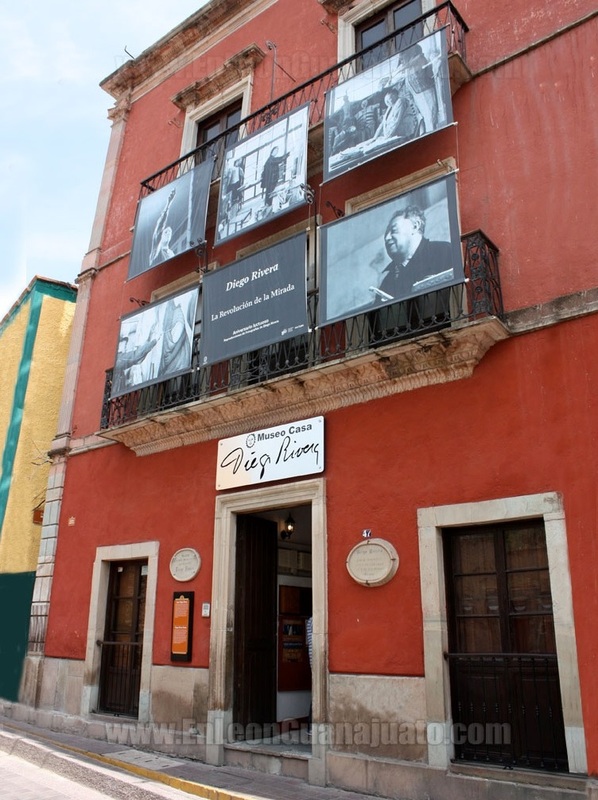 Coming up next in Guanajuato: Museo Casa Diego Rivera, the Mexican muralist’s childhood home. Silver was discovered here in the 1600’s, and within a century Guanajuato had become the largest single source of silver in the world. Magnificent churches and mansions were built with the riches, and one of those mansions survives today as a museum. 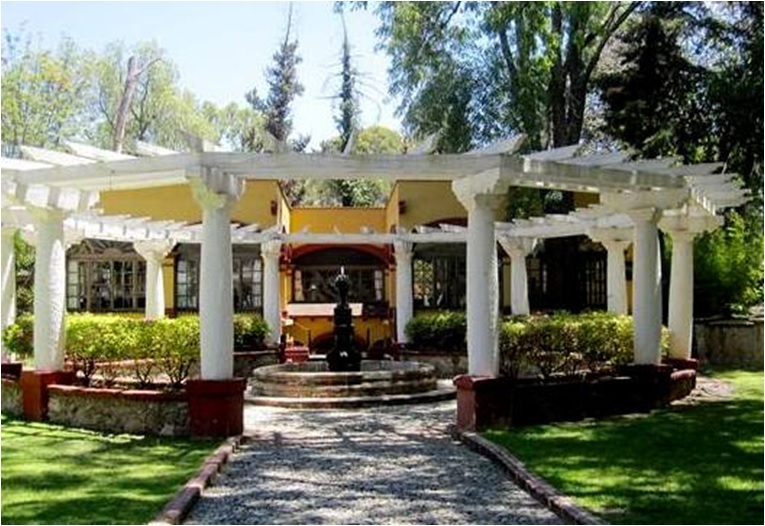 The former Hacienda San Gabriel Barrera, less than three miles from the city center and just off the highway from Irapuato, covers almost five acres. 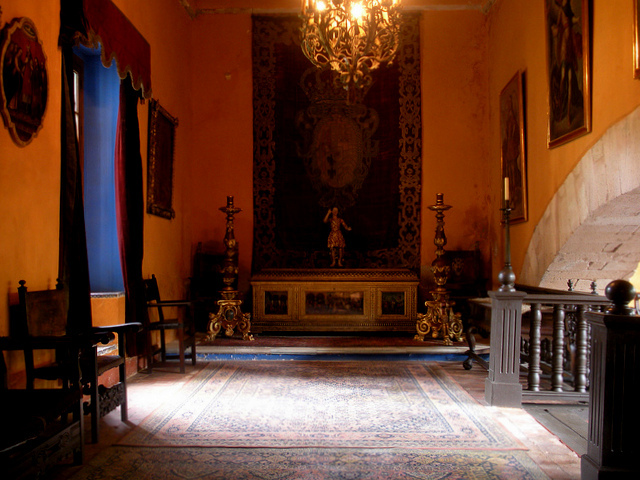 It was one of several estates owned by Captain Gabriel de la Barrera. 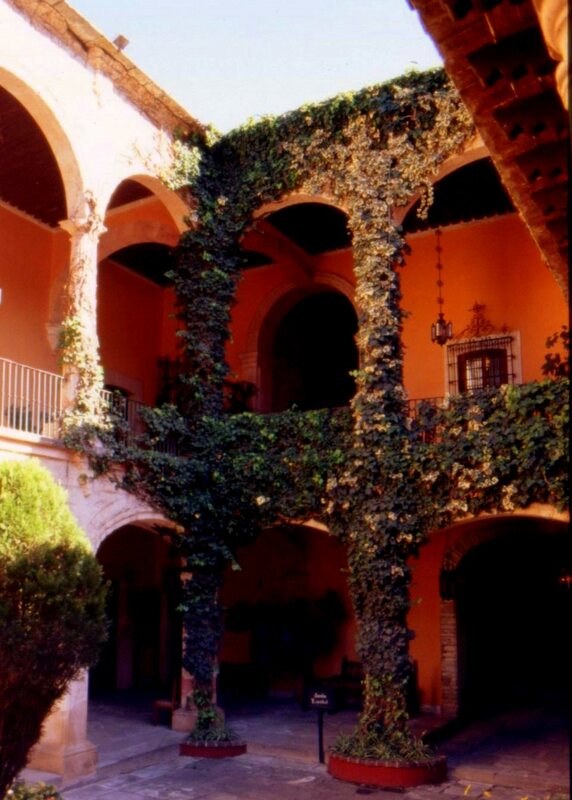 The main house sits among themed, formal gardens, several of which evoke the feel of the Alhambra in Granada, Spain. 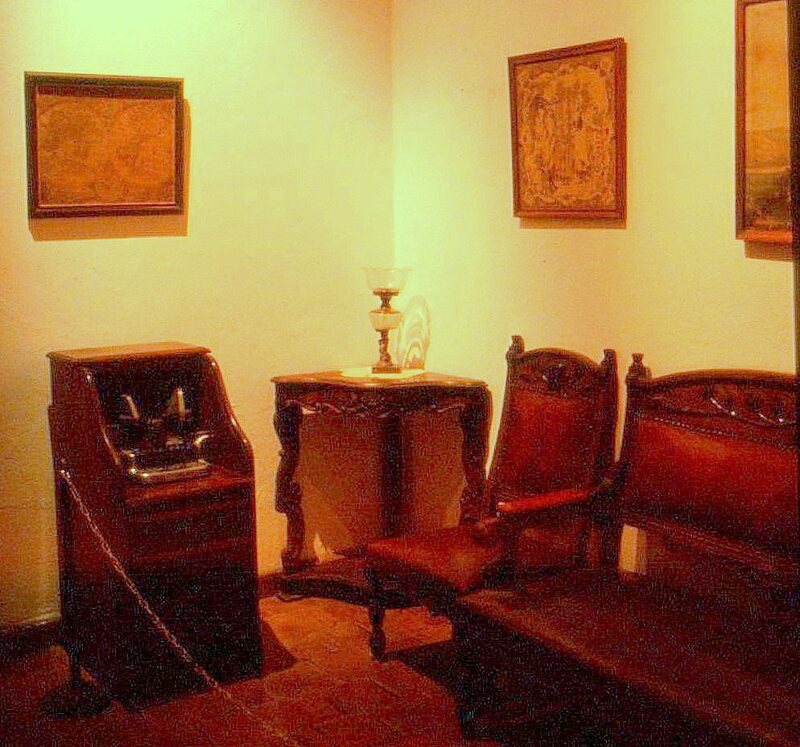 The hacienda house was divided into living space, hacienda offices, a chapel, and a work yard where mined minerals were processed. 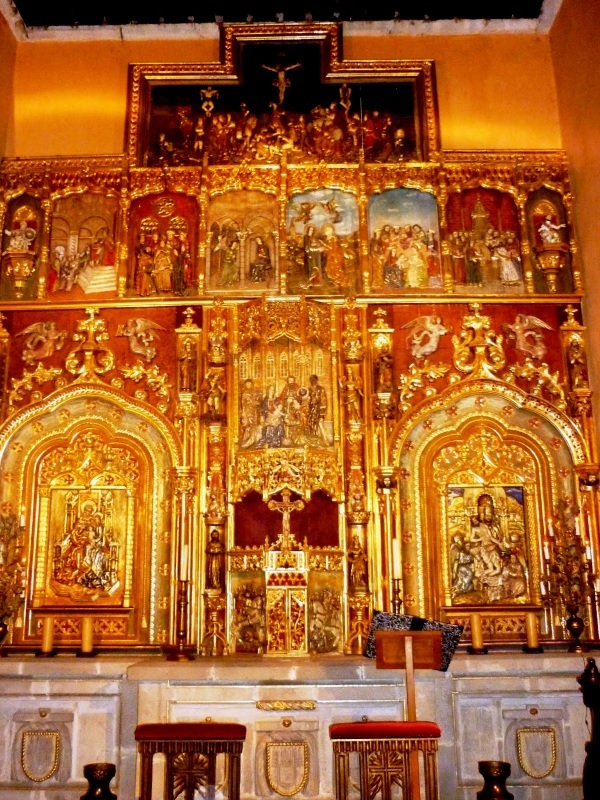 The altarpiece in the private chapel, covered in gold leaf, once stood in the cathedral of Jaen, Spain. 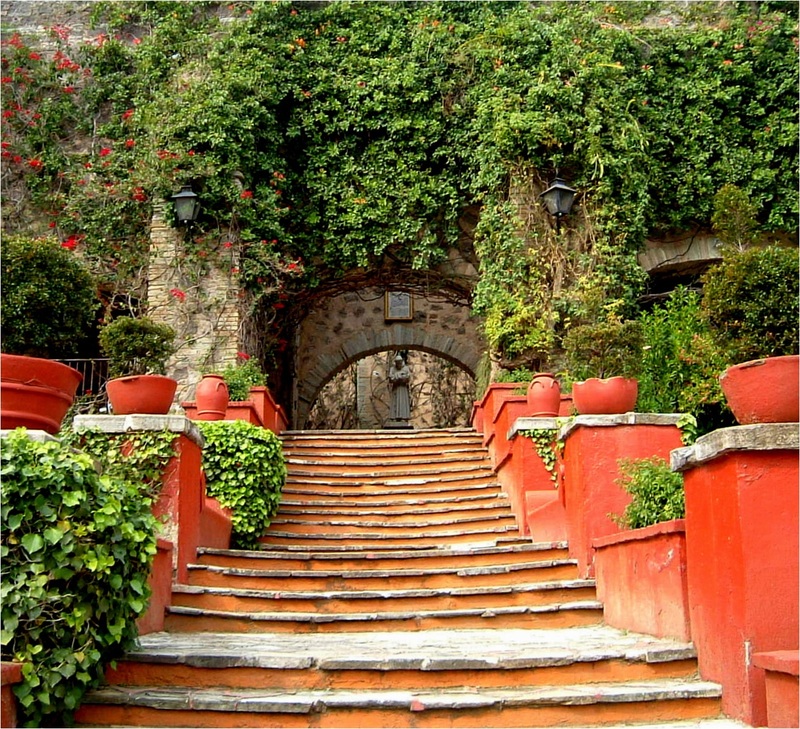 In Mexico, the word hacienda describes the largest of estates. These were profit-making enterprises that had their origins in land grants made by the Spanish crown to conquistadors and royal officials. The first was a grant made by the Spanish crown to Hernán Cortés. 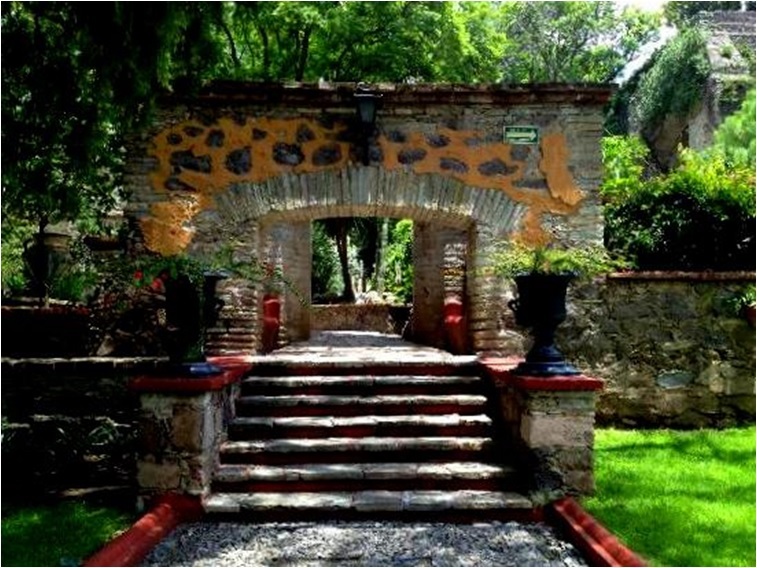 Some haciendas were plantations, some were ranches, and others were mines or factories. Many engaged in more than one of these enterprises. 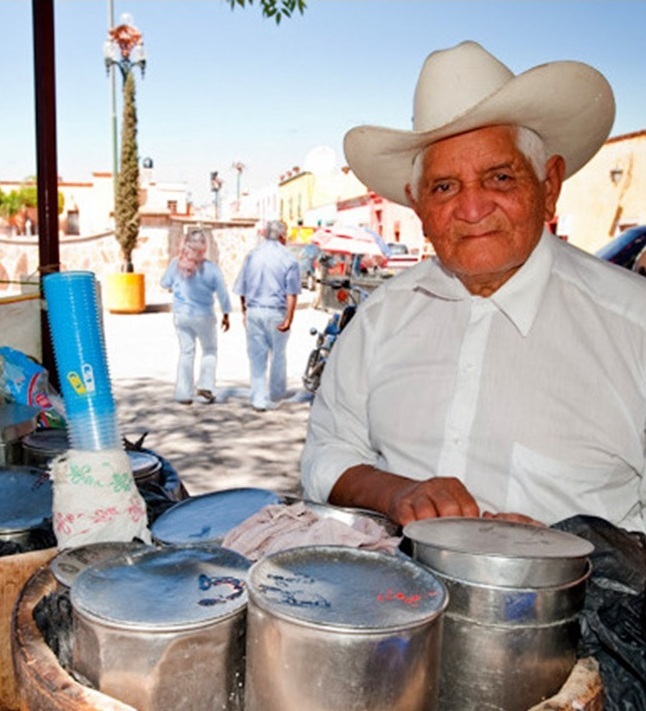 While most hacienda owners – known as hacendados or patróns – lived in or near their haciendas, many of the largest landholders were absentee owners. 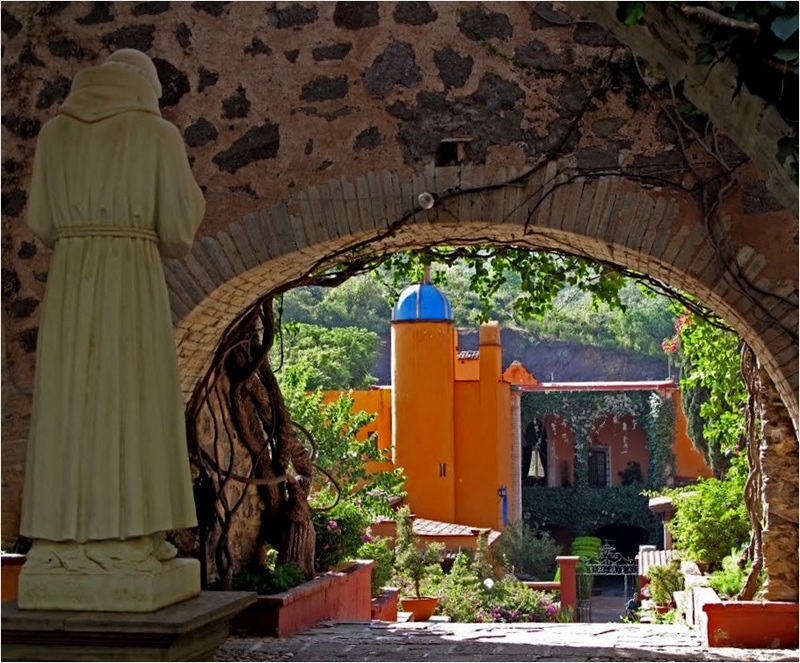 The Catholic Church acquired vast hacienda holdings or loaned money to hacendados. As mortgage holders, the Church’s interests lay with the landholding class, a relationship which eventually left it on the wrong side of Mexican Revolution. 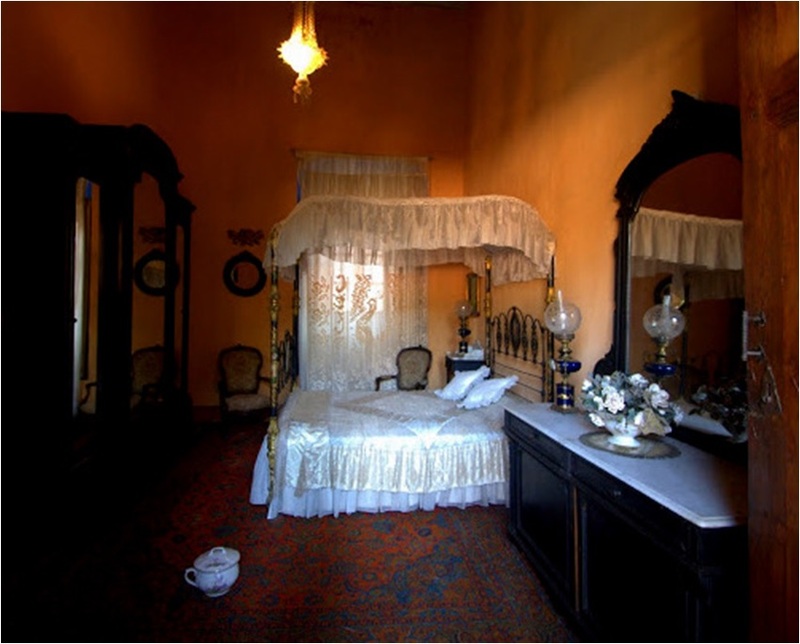 Haciendas are sometimes confused with encomiendas, another type of royal land grant which included the labor of its indigenous population. These grantholders were responsible for instructing the natives in the Spanish language and Christian faith, and protecting them from warring tribes, in return for which they were entitled to exact labor or other tribute. While the encomienda technically honored honor Queen Isabella’s command that natives were “free vassals of the crown” not to be enslaved or displaced, many were forced into hard labor and subjected to corporal punishment or death if they resisted. 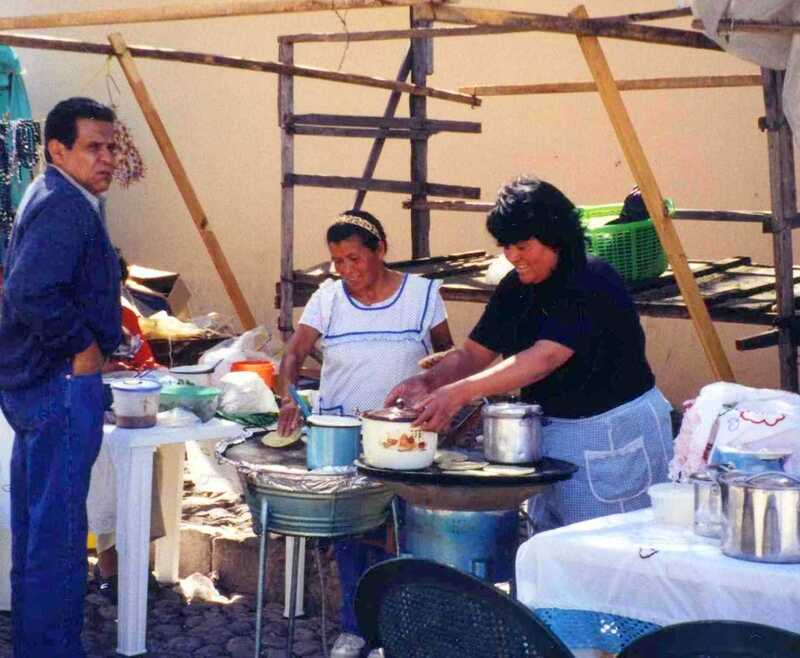 Many hacendados were also granted encomiendas, which gave all of their enterprises access to a pool of indigenous labor. 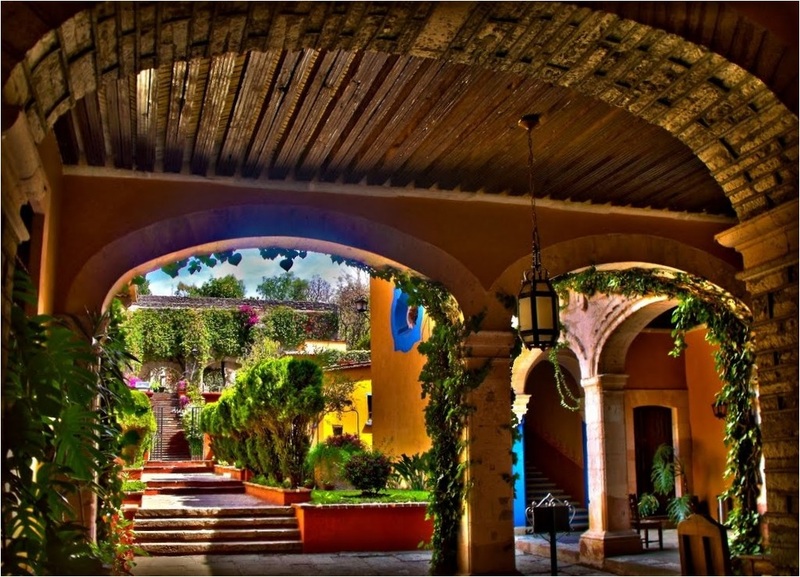 The Hacienda San Gabriel Barrera affords a beautiful setting and unique insight into the lives of the Spanish overlords, but it’s also hard to forget that such prosperity came at a terrible price. 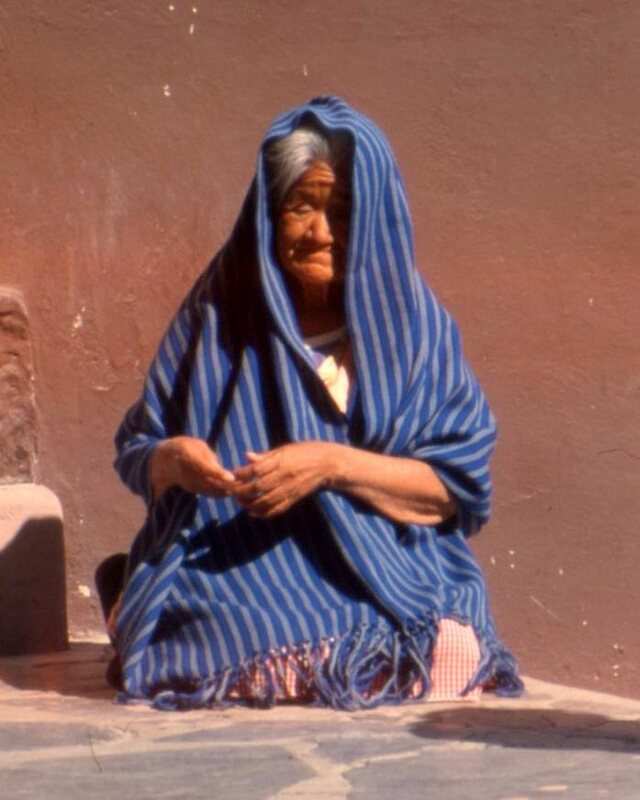 An indigenous Mexican population estimated at twenty-five million persons before the Spanish conquest had, within a century, been reduced by war, disease, and forced labor, and other abuse to a little over one million. 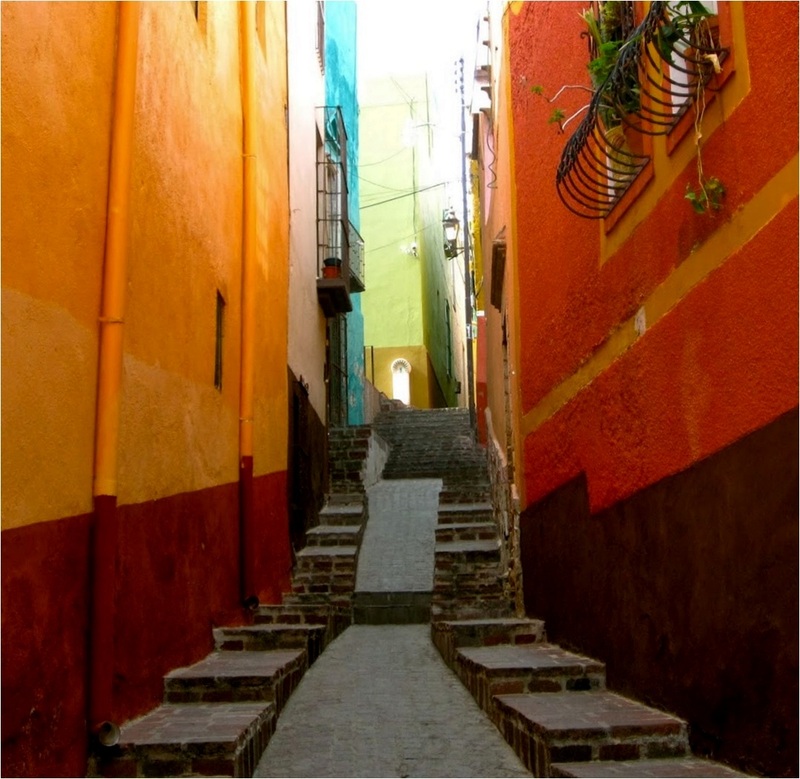 There’s still more to see in Guanajuato, including the boyhood home of twentieth century Mexican muralist Diego Rivera, and the city’s historic center, one of the birthplaces of Mexican independence. San Luis Potosí sits astride the highway that links Saltillo and Monterrey to México City, and completion of the most recent link in the Highway 80 toll road has cut the drive from Guadalajara to just under four hours. I’ve driven it dozens of times on the way to and from the States, stopping no longer than needed to grab a night’s sleep at a roadside hotel, but I’ve decided to begin seeing it one attraction at a time with each new trip. 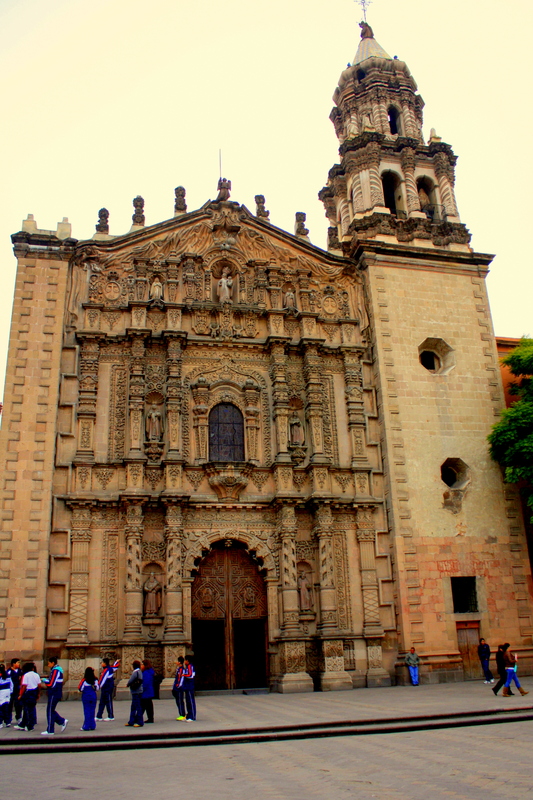 Catedral Potosina, Plaza de Armas, San Luis Potosí, Mexico. 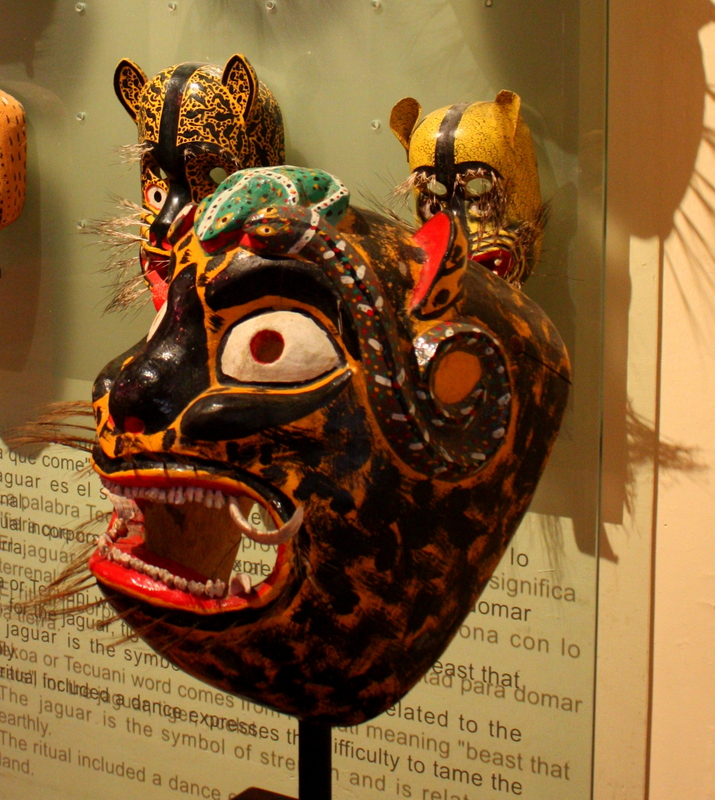 The It was impossible to resist choosing the Museo Nacional de la Mascara – the National Mask Museum – as my first stop. 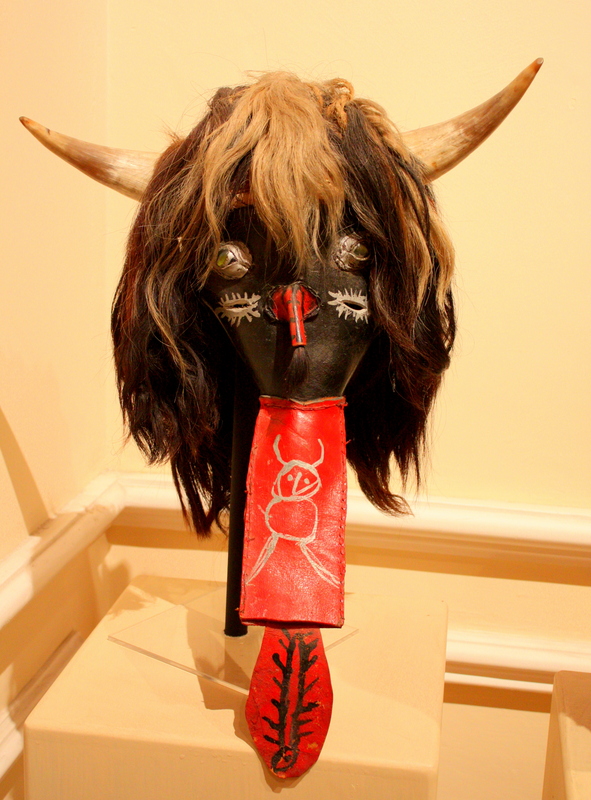 Its collection numbers more than 25 thousand indigenous masks and dance costumes, most of Mexican origin. 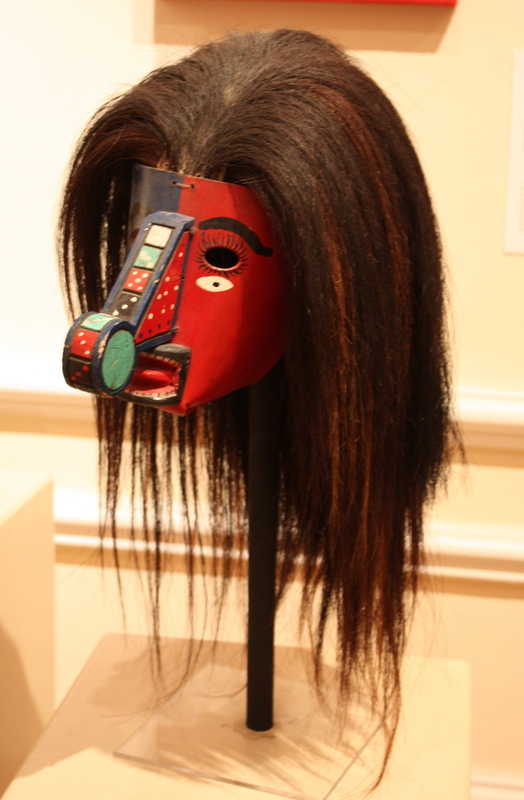 There are also a few Asian masks, mainly from India. San Luis is one of México’s colonial Silver Cities, and mines in the surrounding mountains were for two hundred years some of the nation’s most prolific producers of minerals and precious metals. 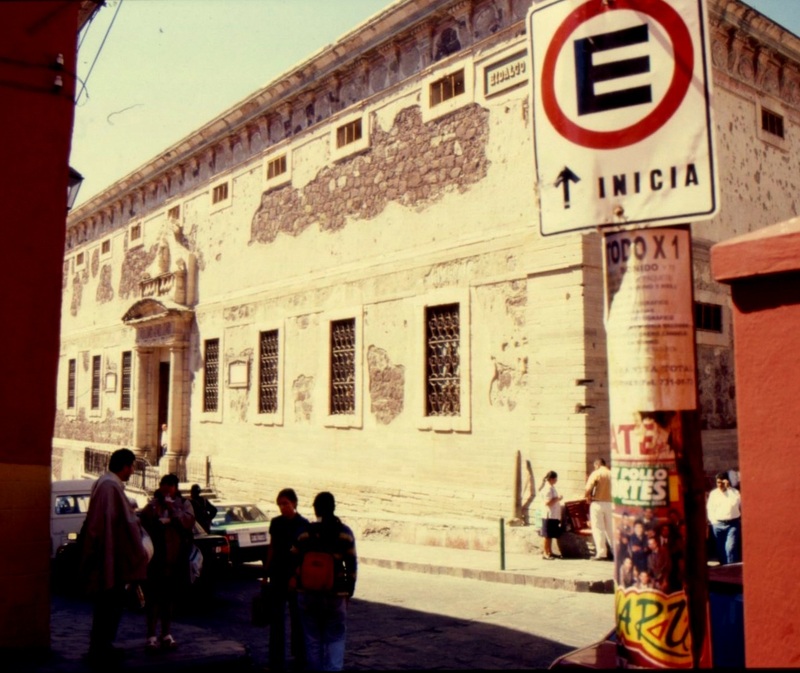 No surprise, then, that Spanish added the word Potosí – ” fortune” – to the city’s name when silver was first discovered, or that the image of a mine entrance flanked by two silver and two gold bars appears on the city’s coat of arms. Today mining only accounts for a fraction of the local economy. Only the deteriorating remnants of the American Smelting and Refining Company’s offices in the city’s Colonia de Los Gringos, and ghost towns like Cerro de San Pedro in the surrounding mountains testify to mining operations that continued until the Second World War. The metro area is now home to more than 2 million people, and mining has now been replaced by manufacturing, services, and agriculture. Many foreign companies have been attracted its new and massive multi-modal logistics center. San Luis is the only inland port in Mexico to be designated a Free Trade Zone. 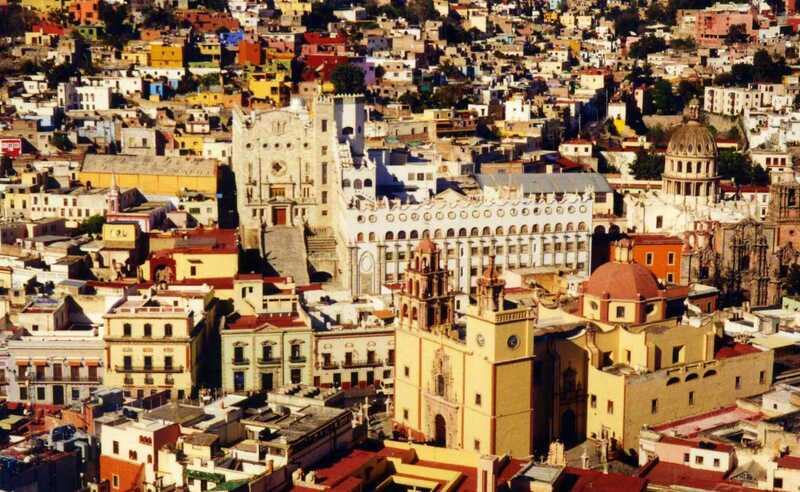 Founded only twenty-five years after the Spanish conquest of México, San Luis is one of the nation’s oldest cities and one rich in historical tradition. 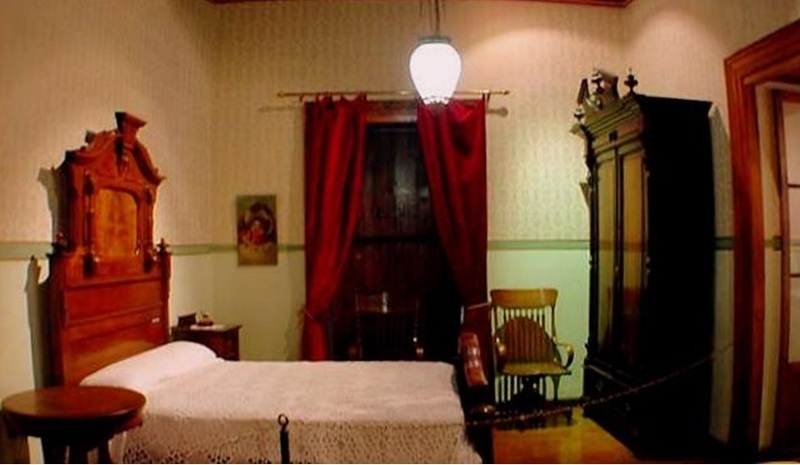 In the 1860’s, it was for a time the seat of President Benito Juárez’s government during the French occupation of México. 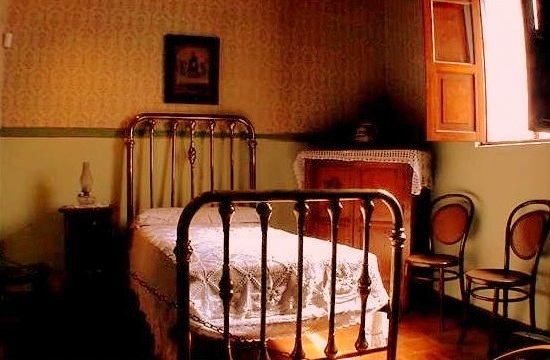 Fifty years later, Mexican patriot and president Francisco Madero was held there under arrest until his escape in 1910, when he called his countrymen to revolution with his Plan of San Luis. The colonial center is home to many beautiful and historically significant colonial buildings, and has been closed off to vehicular traffic. Only a couple of miles off the expressway, I park curbside at the Alameda Central, a public garden park that covers more than ten city blocks. From there it’s a walk of just one block past the Art Deco Cine Alameda to the Plaza del Carmen, and from there only two blocks further to the Plaza de las Armas. 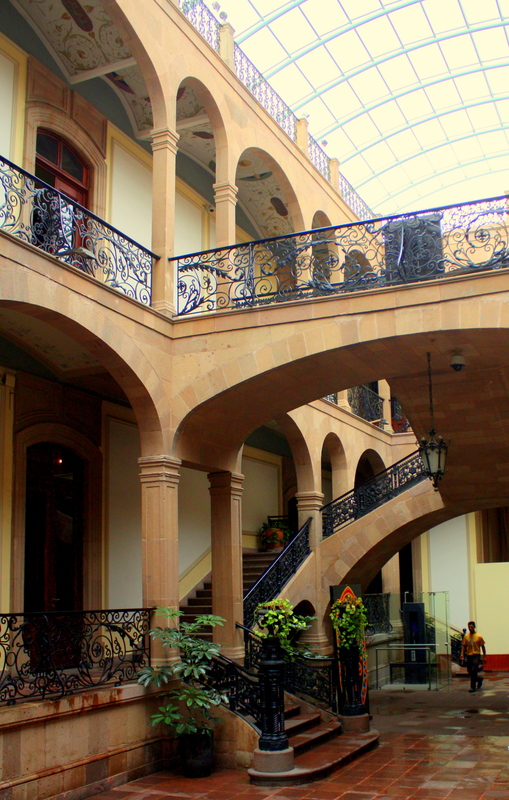 The museum is housed on the Plaza del Carmen in the magnificent “Marti Palace,” which was completed in 1897 as the residence of a prominent landowner and miner. 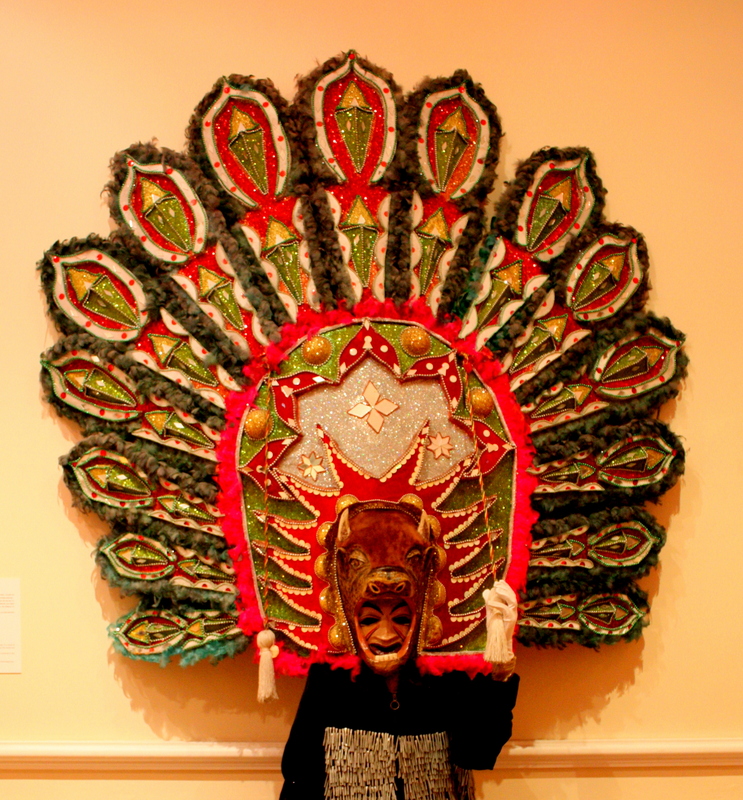 After it passed from family ownership, the building was home to various federal government agencies until 1982, when it became the home of dance masks donated for public viewing by engineer and collector Victor Jose Moya. 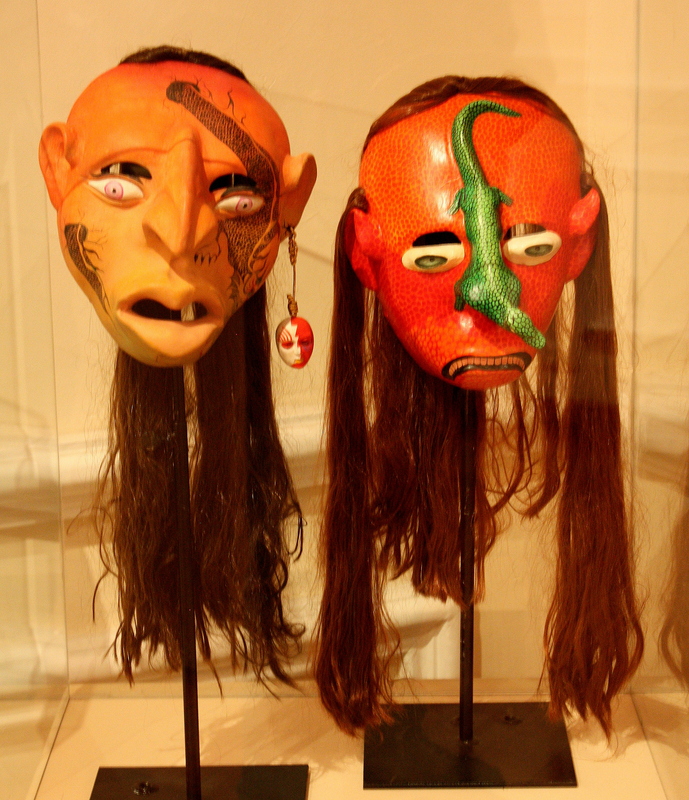 The Spanish tried unsuccessfully to ban the use of masks, which was a well-established part of ritual life in Mexico when they arrived. 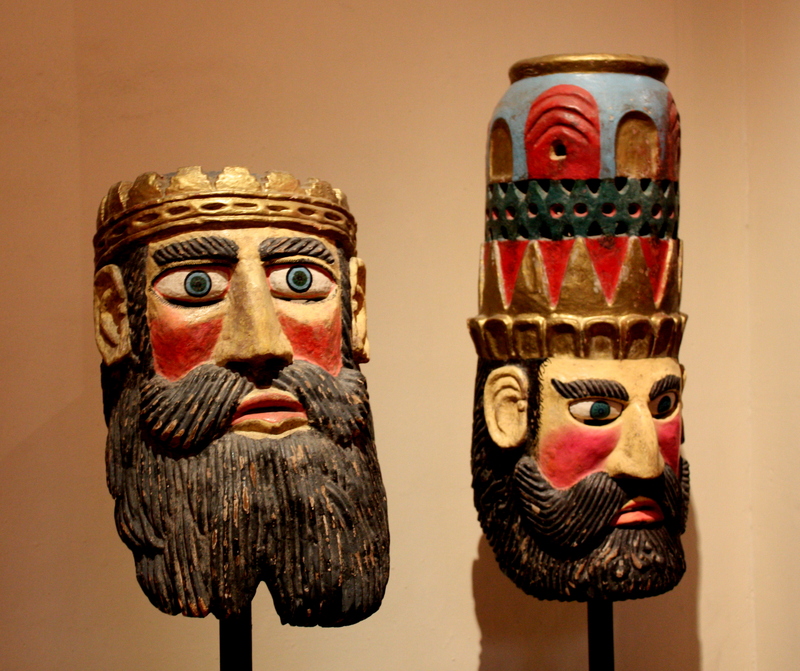 Most are made of wood, but it’s not uncommon to find others made from leather, wax, bone, cardboard, or paper mache. Their uses are varied, but they are almost always a part of ceremony and ritual, appearing most often in theatrical dance and processions. Priests used masks to incarnate deities, and warriors wore masks of predators like the jaguar and eagle warriors in the belief that they would be imbued with the animal’s strengths. Since Mexican Independence, mask traditions have continued to evolve into forms that depict Mexico’s history and popular culture. It’s taken me less than half a day to walk the Centro Historico and the museum, and it’s been a delightful break from a long road trip. For the next trip I’ve set my sights on the city’s The Museo del Centro Taurino Potosino (Potosí Bullfighting Museum), and its collection of bullfighting photographs, posters, clothing and equipment that once belonged to famous matadors.